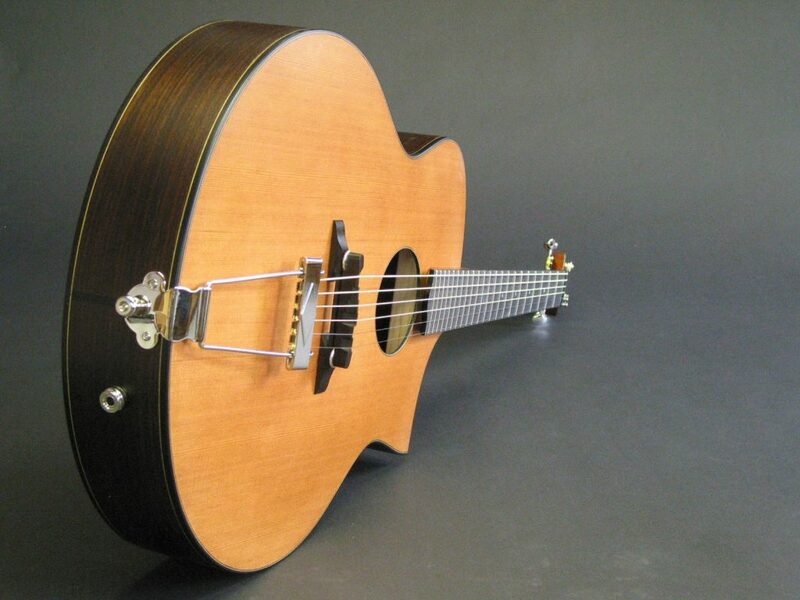 I build all sorts of custom guitars, both acoustic and electric. 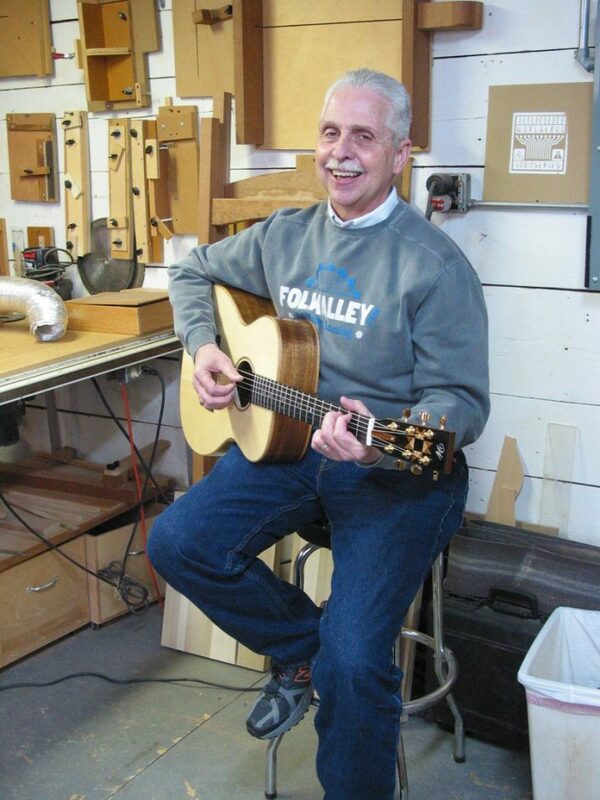 If you have an idea for a particular guitar I can build it for you. Custom shape? Woods? Color? Neck size and feel? Pickups? More strings? Whatever you want. 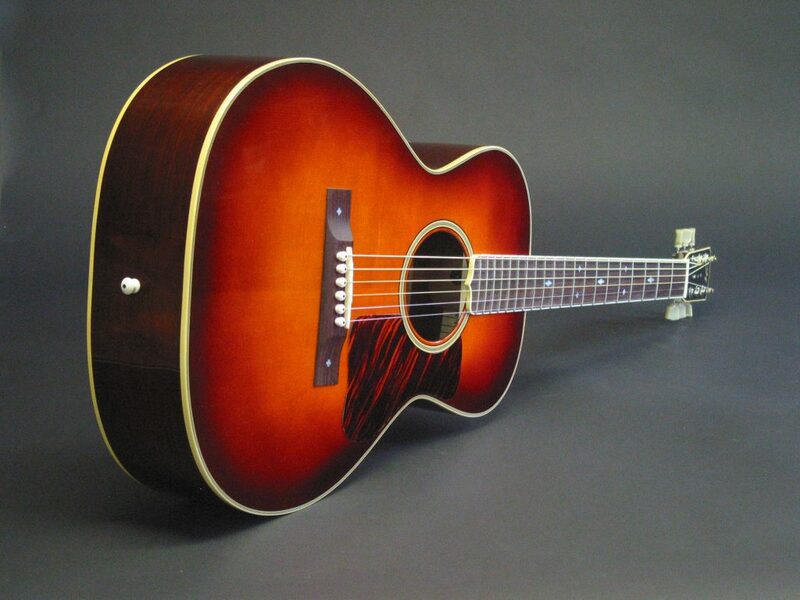 This can be the guitar that sets you apart and gives you your distinctive look and sound. 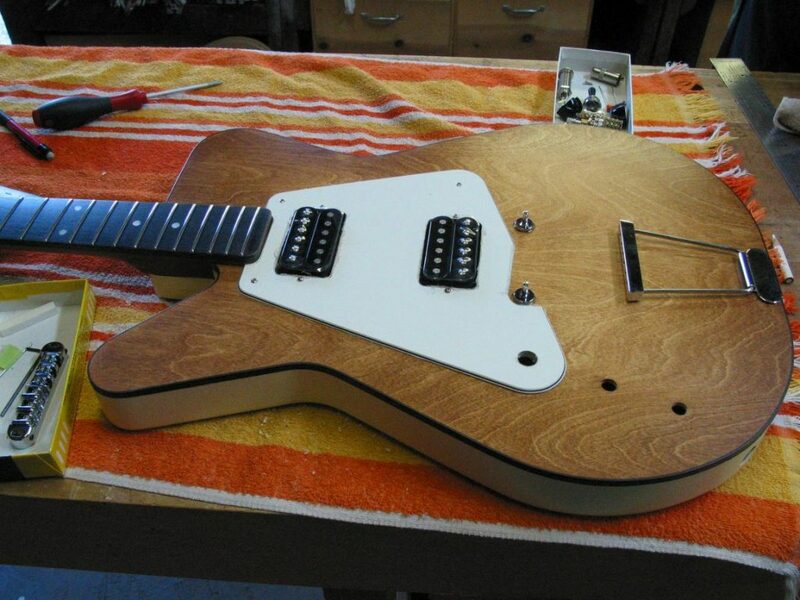 A bare bones electric might start around $500. 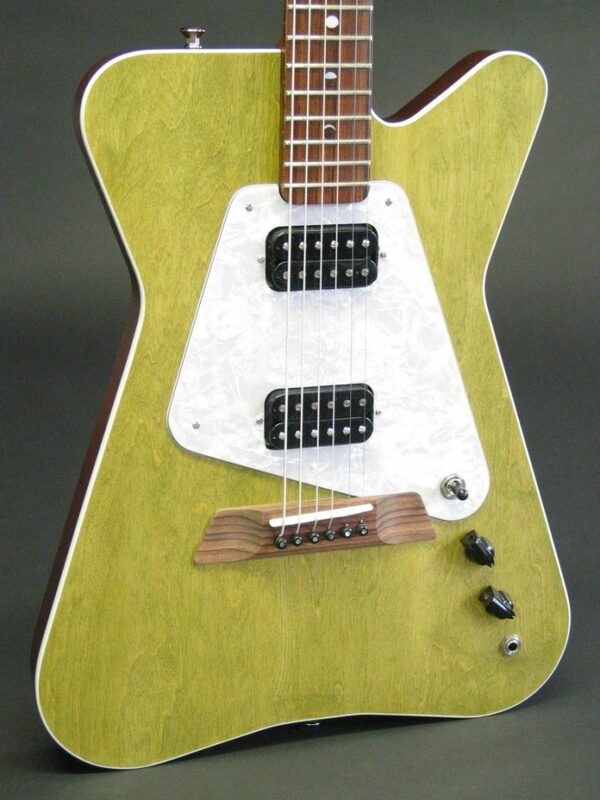 For $1000-2000 you can get a really nice custom electric. $2000-$5000 if you want something totally outrageous. 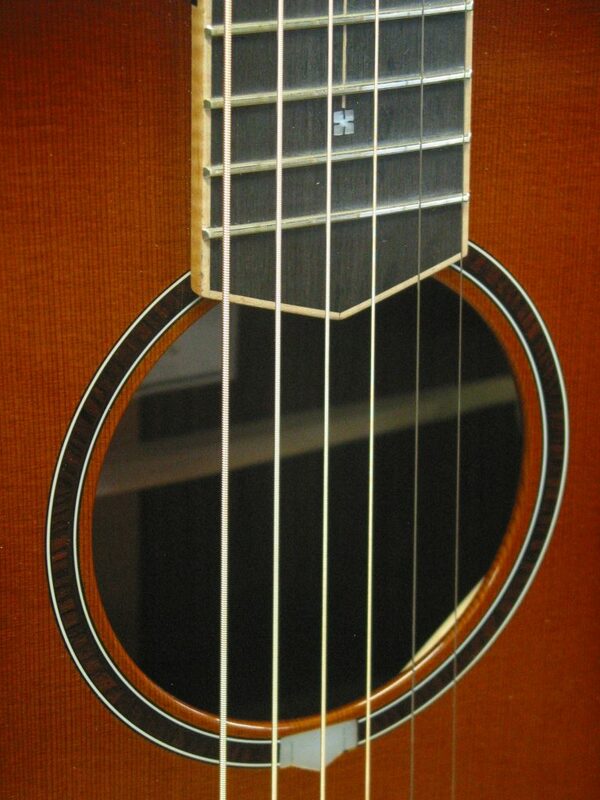 For an acoustic guitar $1500 will get you a bare bones but very high quality, great sounding guitar. 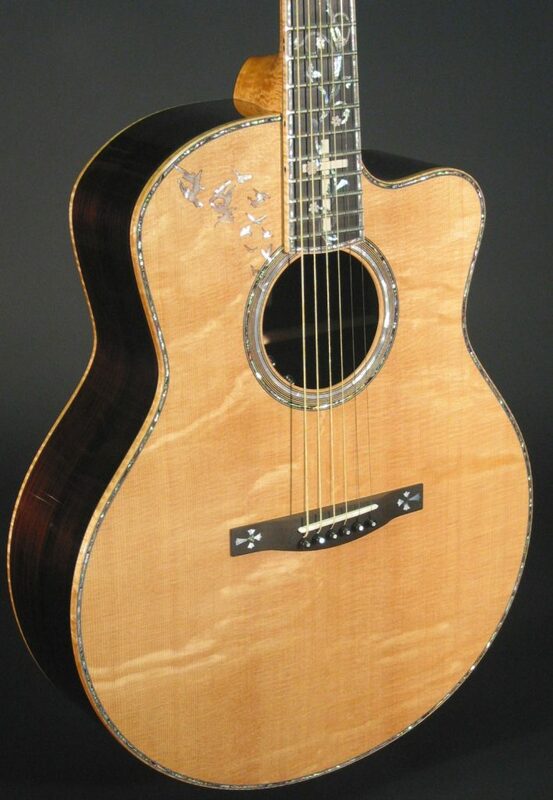 $2000-$4000 gets you something fancier with custom woods, inlay etc. $5000-10,000 gets you a stunning work of art. A very simple yet great sounding and playing guitar. 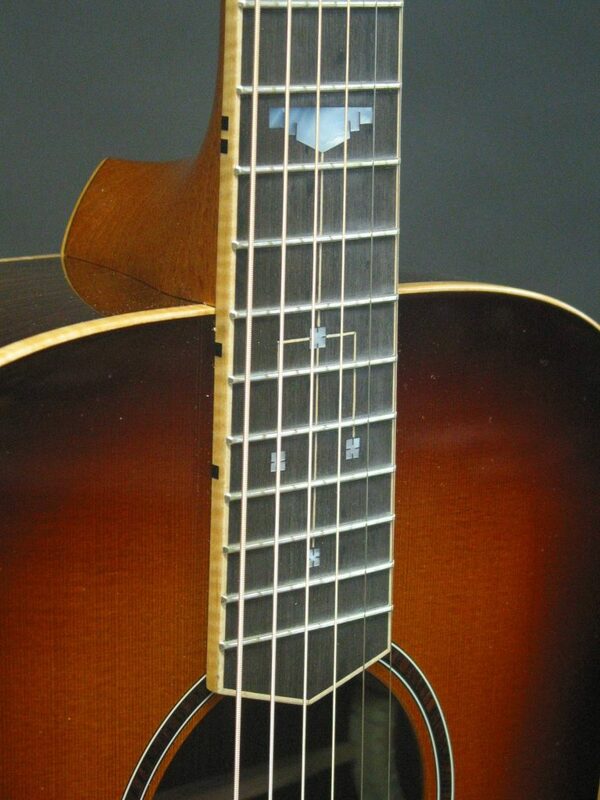 This is my Prairie Model, my most popular acoustic model. My SonoPhonic model hollow body electric with a Bigsby vibroto and custom pickups. 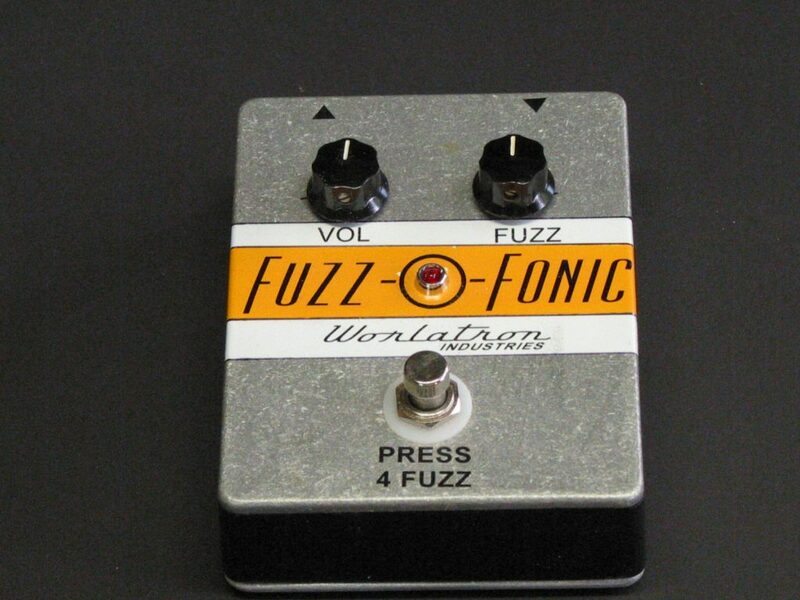 Sweet rich tone. Play it plugged or unplugged. 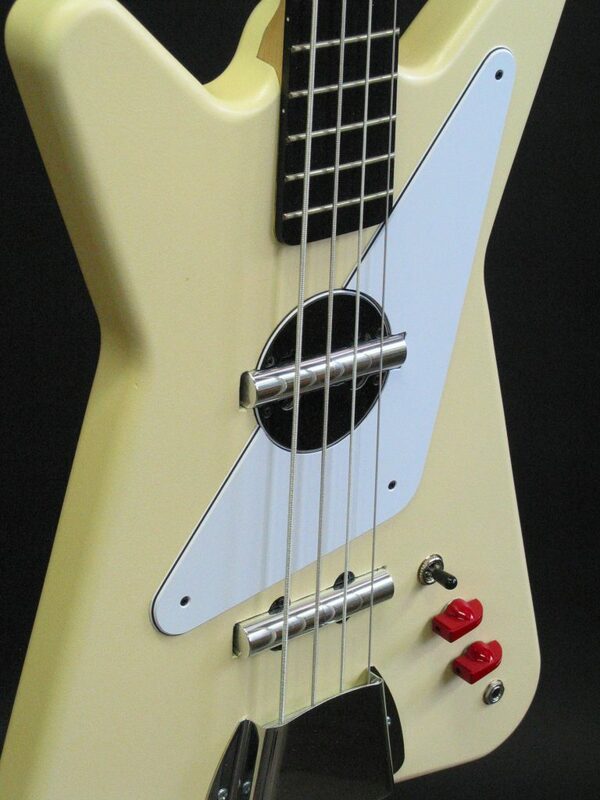 You can get more information about my SonoPhonic Guitars on my Worlatron page. 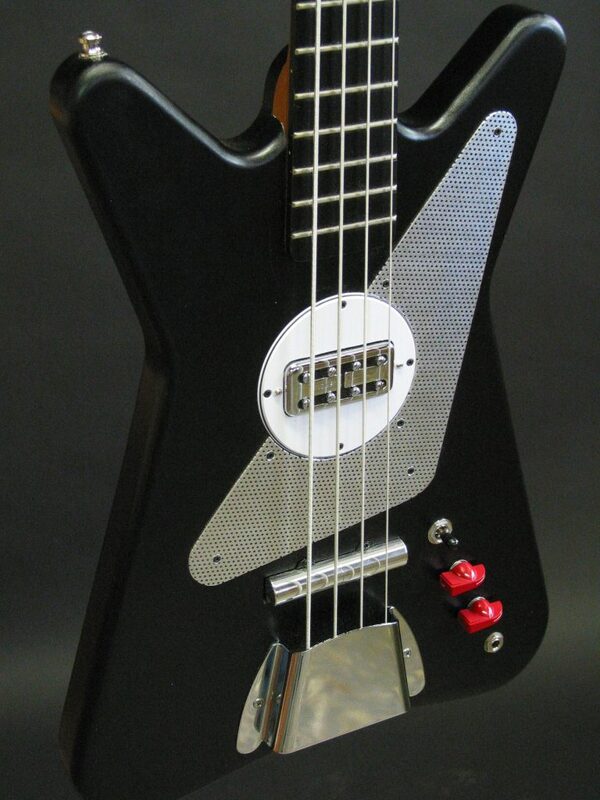 Mandocello with 8 strings on a guitar body. 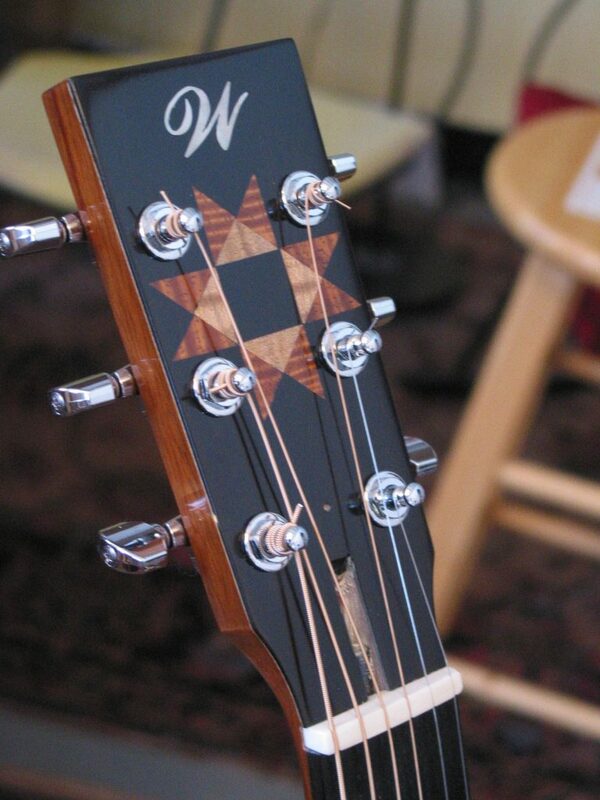 Sunburst finish and V8 headstock inlay. 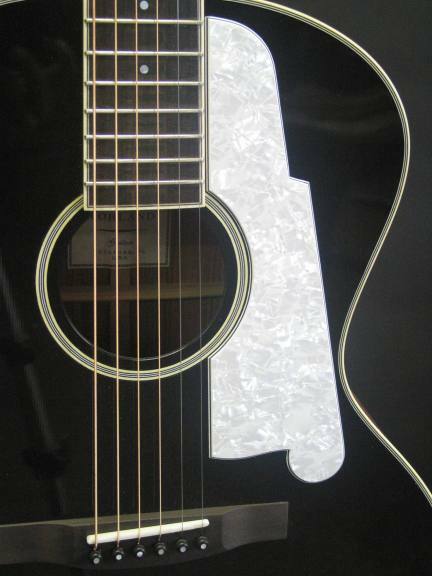 A guitar was commissioned by SnapOn tools. They wanted the neck to look like a SnapOn wrench with a custom graphic paint job. They were not disappointed! Left handed hollow body electric with humbuckers. 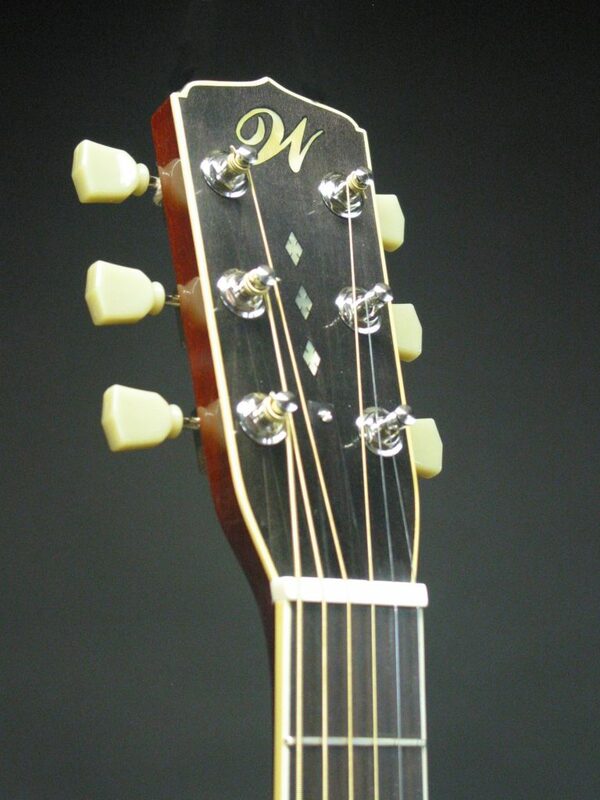 You can get more information about my SonoPhonic Guitars on my Worlatron page. The customer picking up his new guitar for the first time. 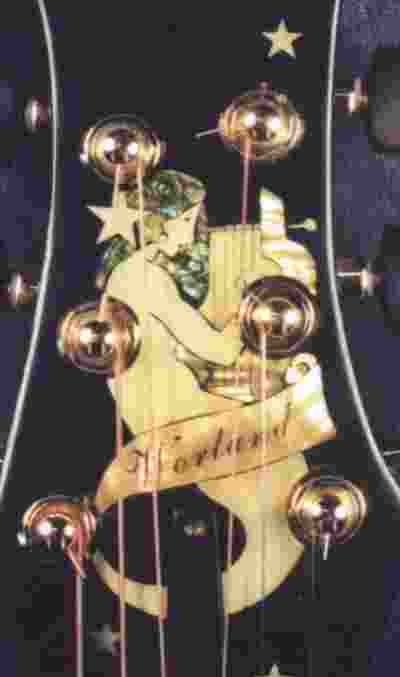 The head stock features a quilt star inlay he requested in honor of his quilter wife. 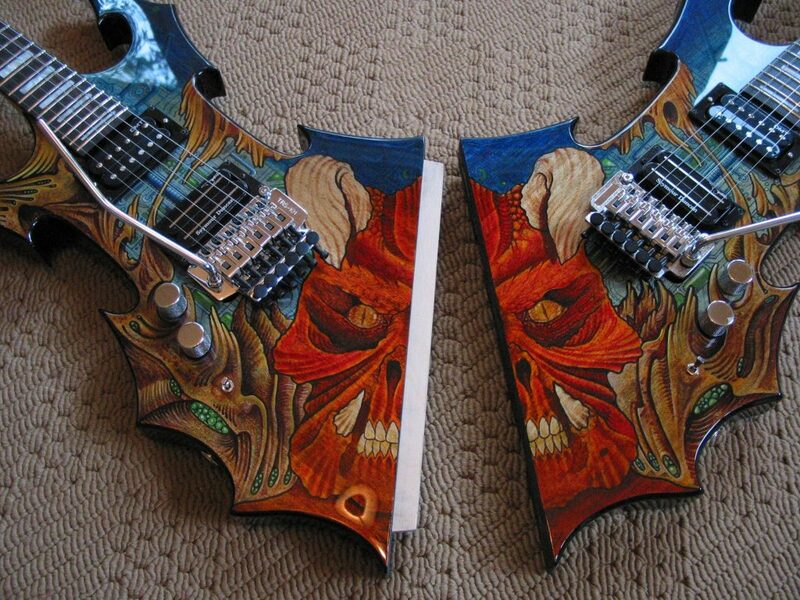 Double guitar inspired by Michael Angelo Batio. 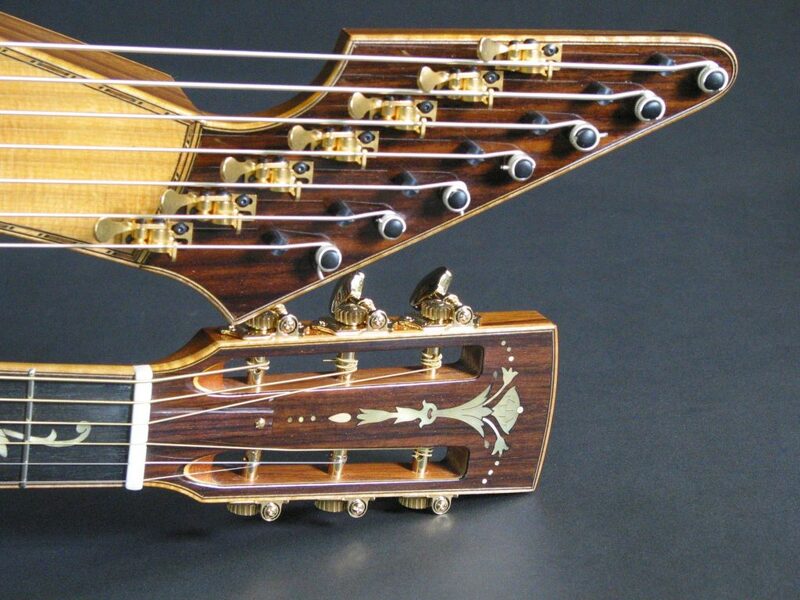 Two guitars that snap together for a right and left hand double guitar. 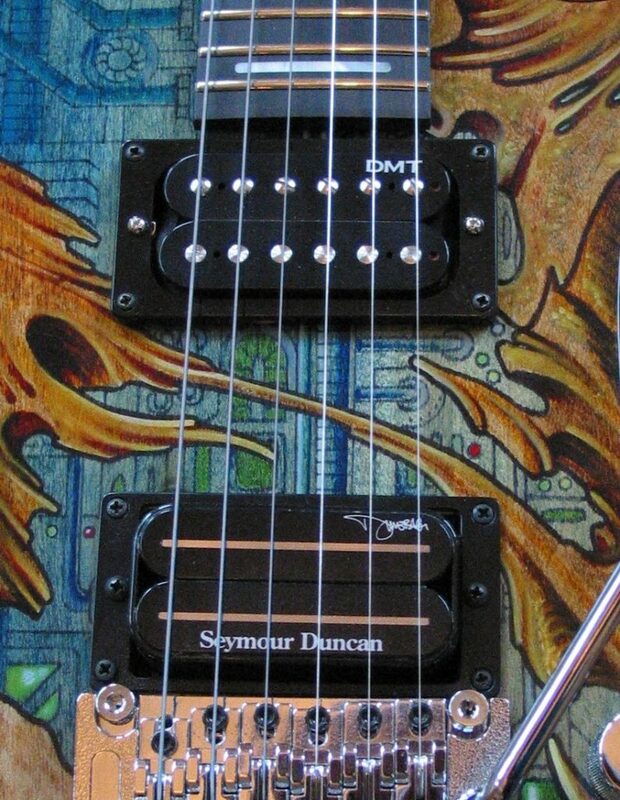 Floyd Rose trems and Seymour Duncan pickups. Crazy! 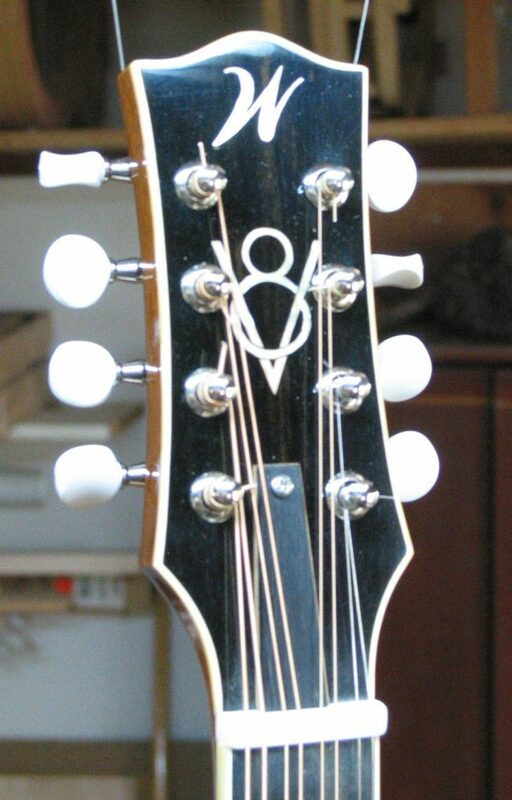 Basic harp guitar with 6 sub basses and 6 guitar string on the neck. 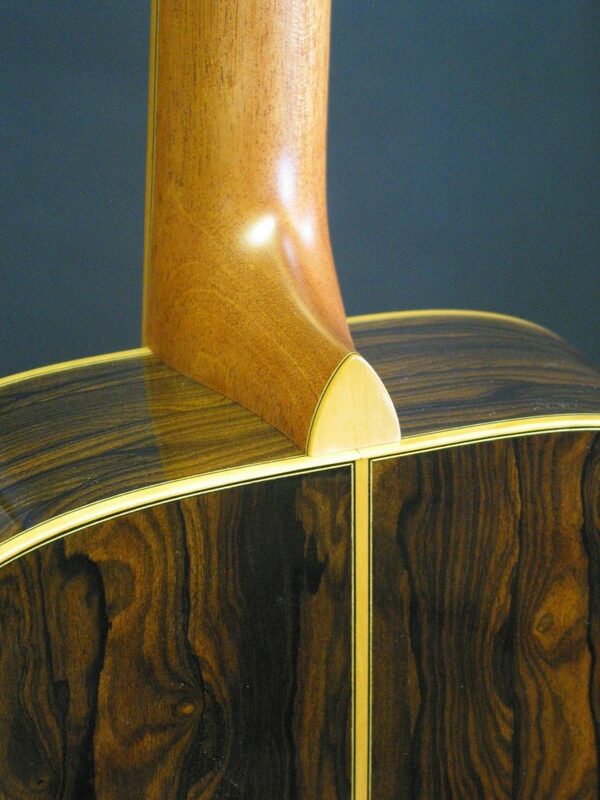 Walnut body with a sitka spruce top. Fairly bare bones looking but deep rich beautiful tone. 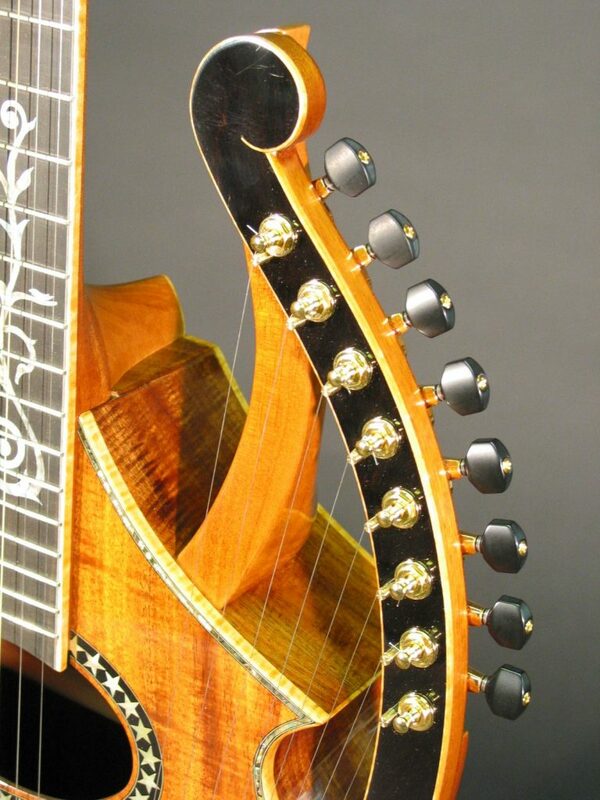 21 string harp guitar with 7 sub basses and 8 super trebles and 6 main strings. 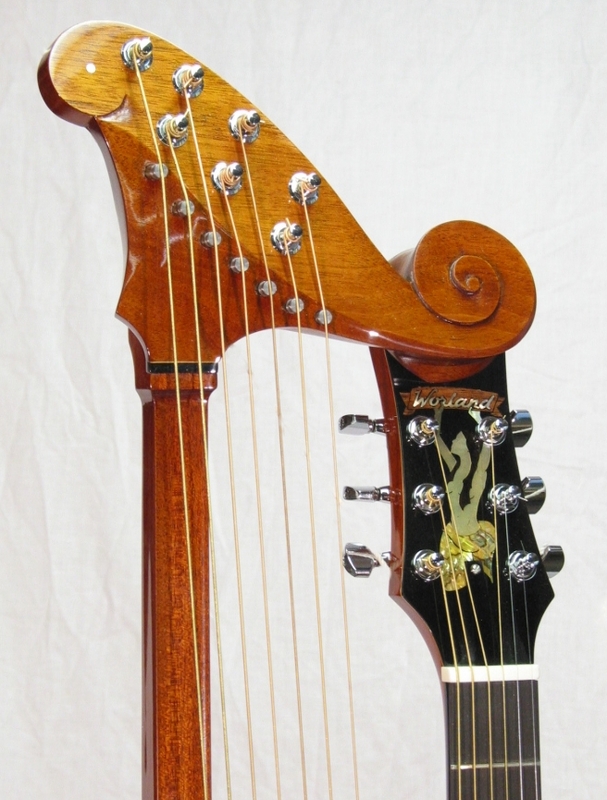 All the harp string have sharping levers to easily change keys by adding sharps and flats. 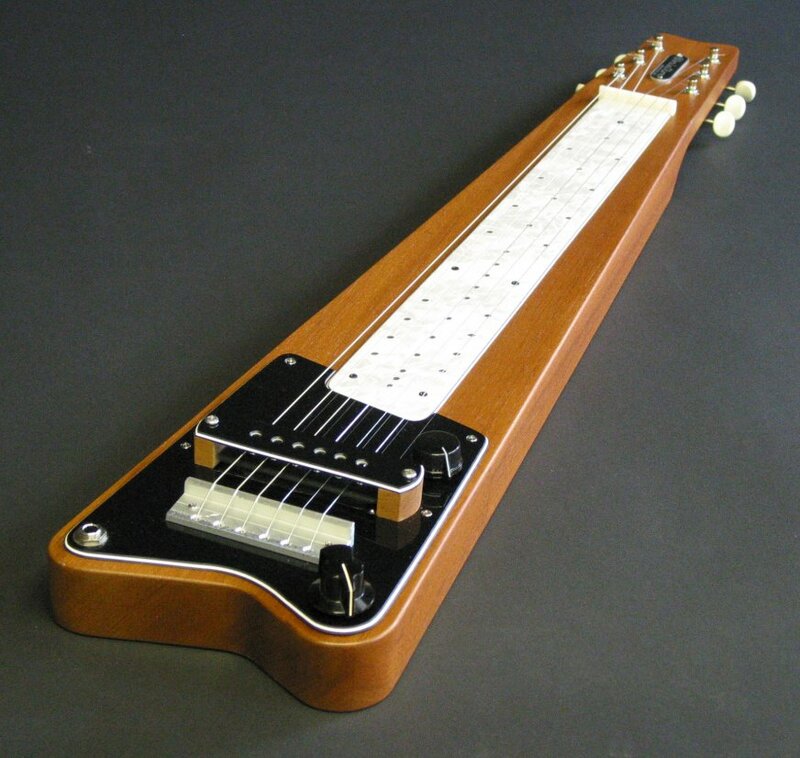 Lap steel electric with 6 strings and a Chicago style (beefy) pickup like the old time lap steels used. 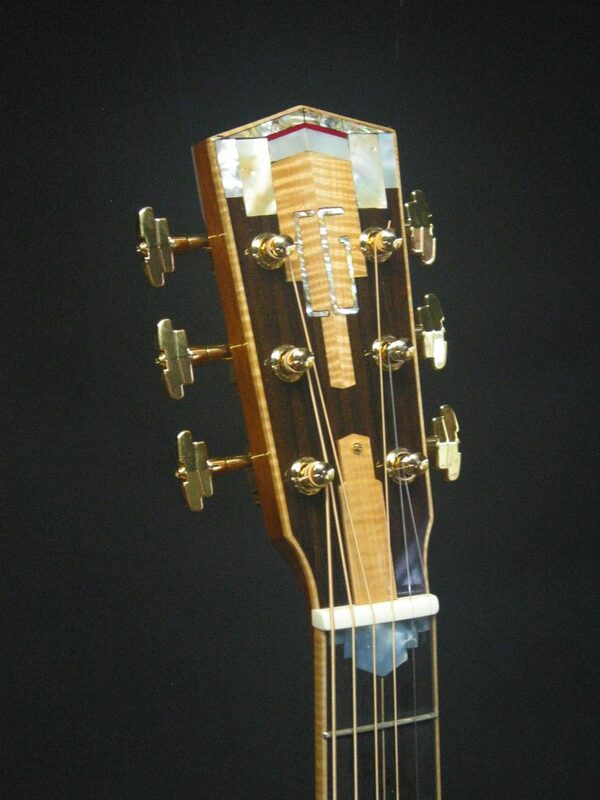 Mahogany body with pearloid fingerboard. 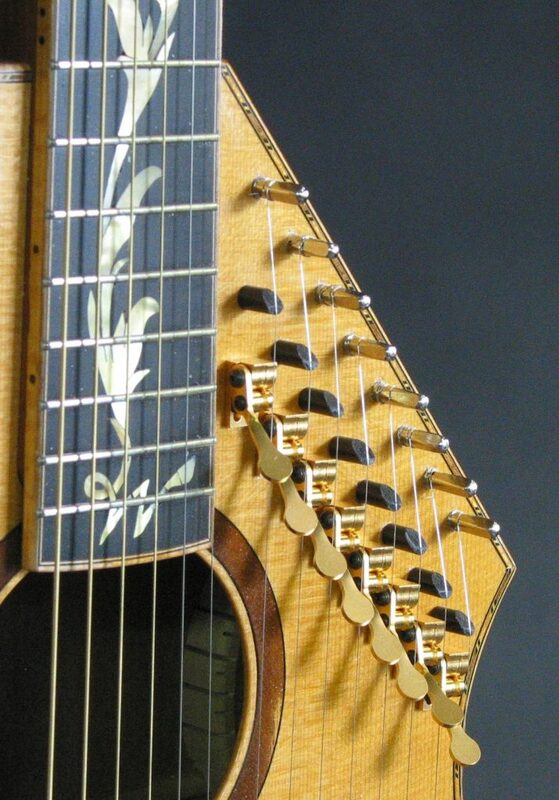 A 13 string harp guitar with 7 strings on the neck and 6 floating sub basses. Hollow body with Bartollini jazz pickups and volume control. 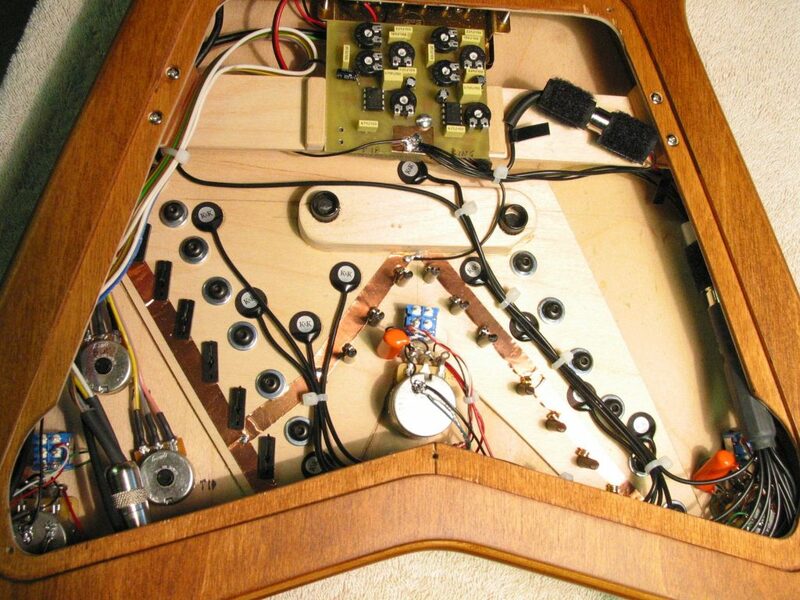 Pickups are wired in stereo so you can amplify them separately with a preamp. 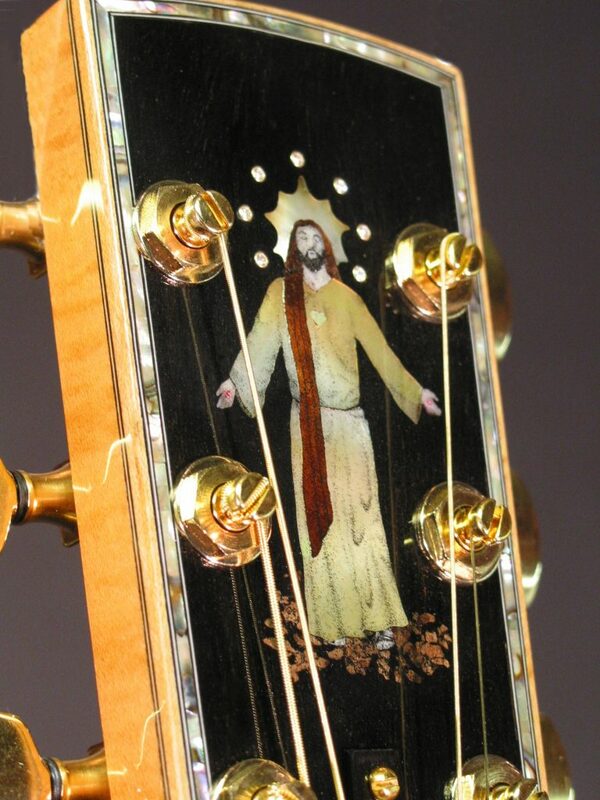 A full body acoustic with a jazz style bridge and tailpiece. 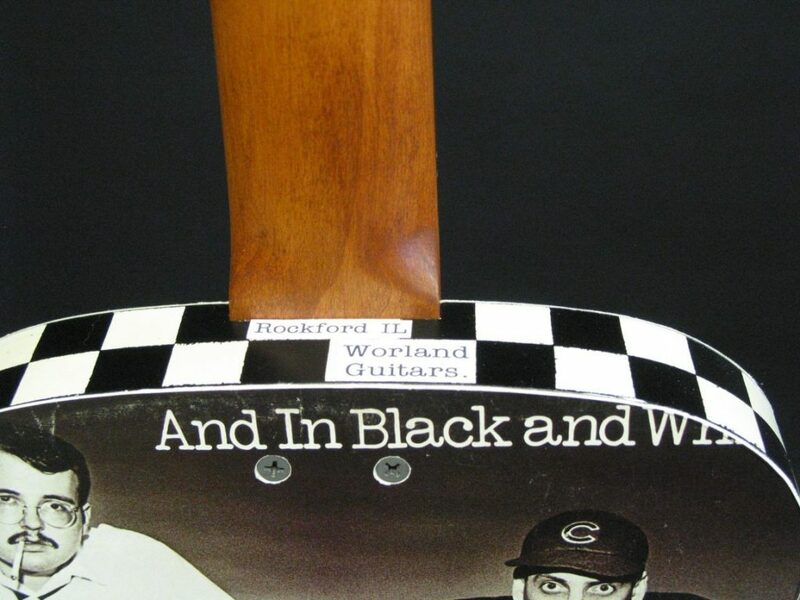 The fingerboard has an inlay of a lightening bolt in honor of the customer’s guitar hero Lightnin Hopkins. Cool look and sound. 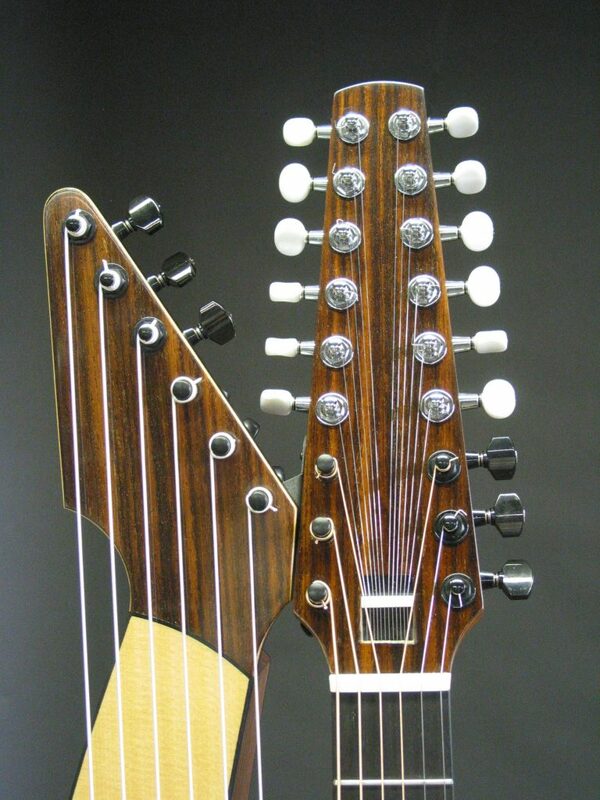 A double neck with an 8 string and a baritone neck on a walnut body. 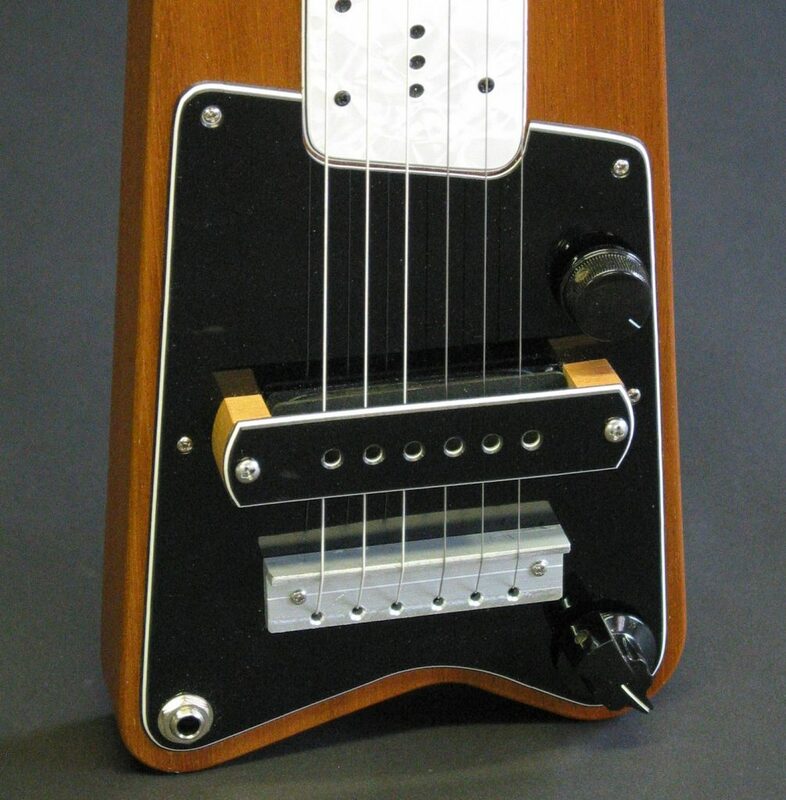 All the pickups have single coil taps and can be blended with their individual controls. 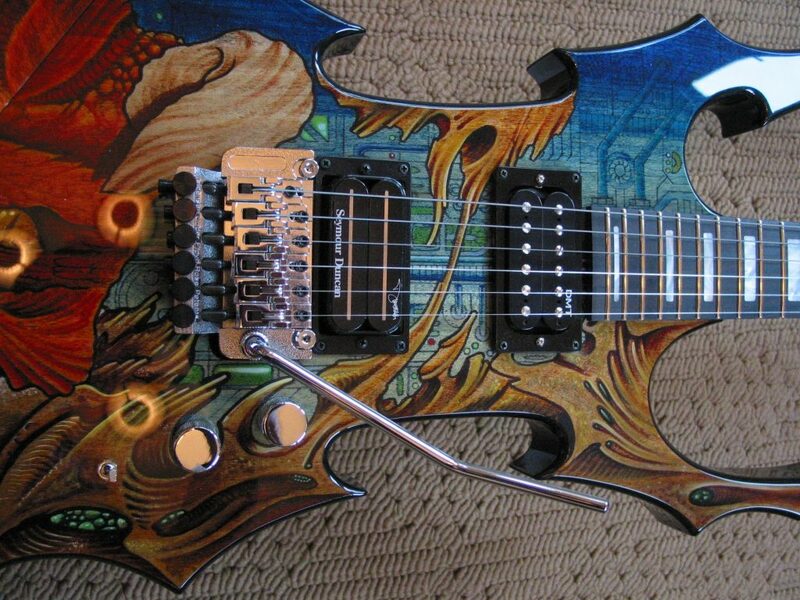 A heavy beast of a guitar but sounds killer! 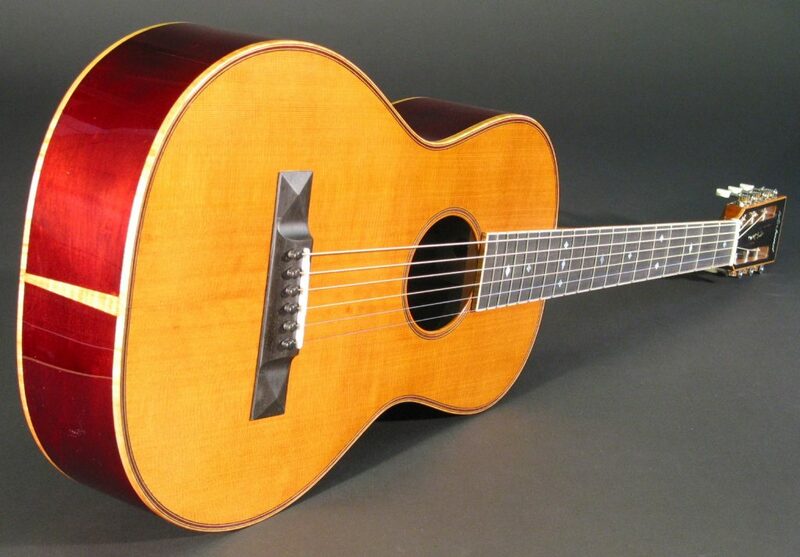 Chicago composer Brett Barton wanted a custom acoustic for composing and recording. This has stunning cocoblolo back and sides. 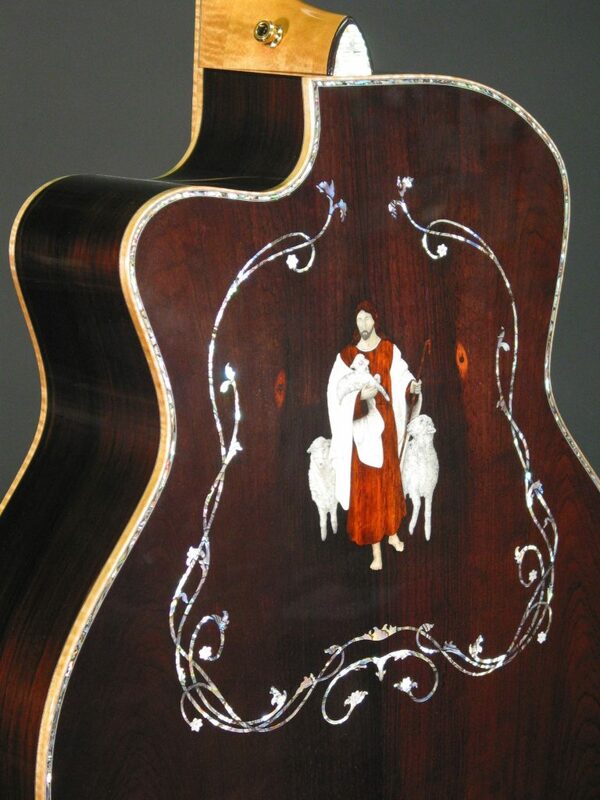 The inlay represents his wife and children. 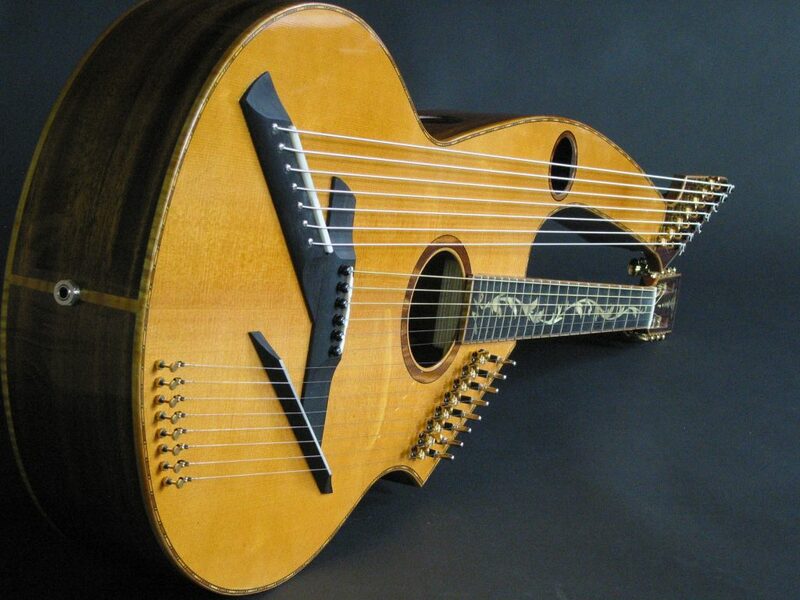 A hollow body 20 string harp guitar. 6 sub basses, 6 main strings, 8 super trebles. 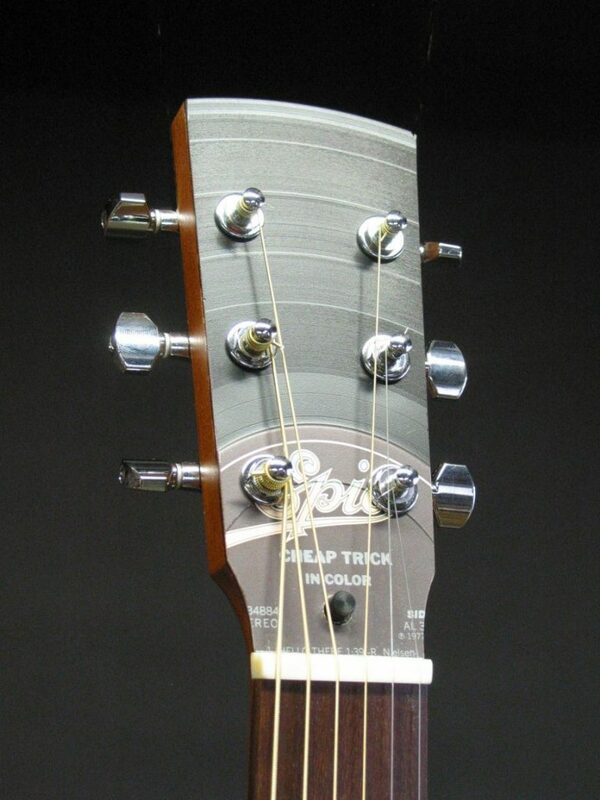 Each bank of strings has a humbucker with single coil taps as well as acoustic pickups inside the guitar. 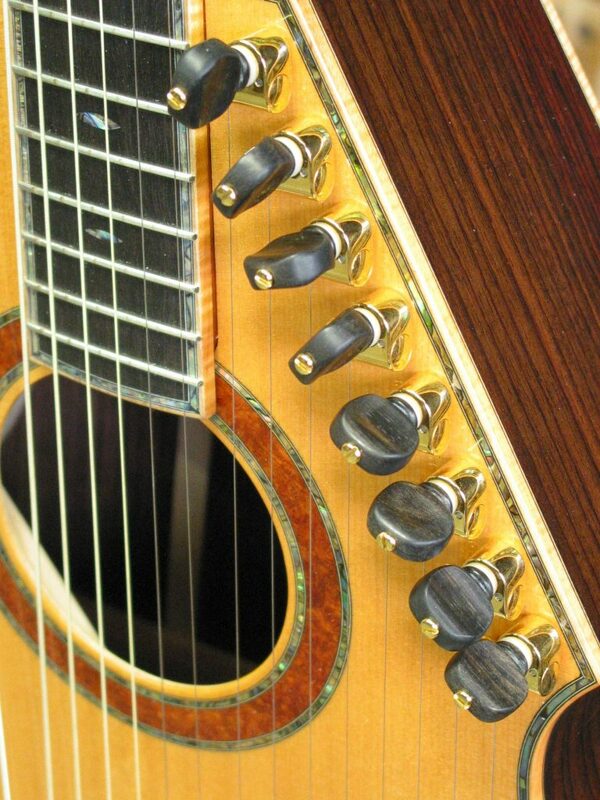 An on board preamp blends the magnetic and acoustic pickups together for a huge range in tones. 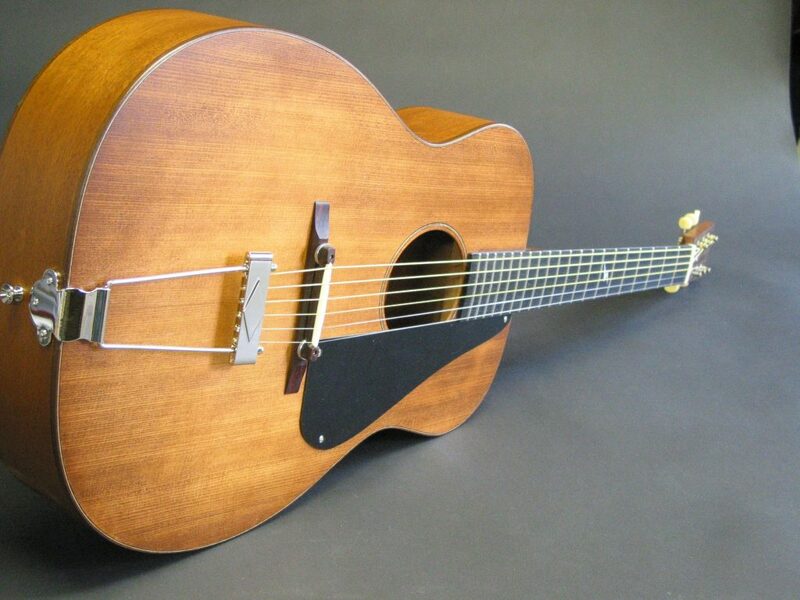 A fairly light weight guitar considering all the things you can do with it. 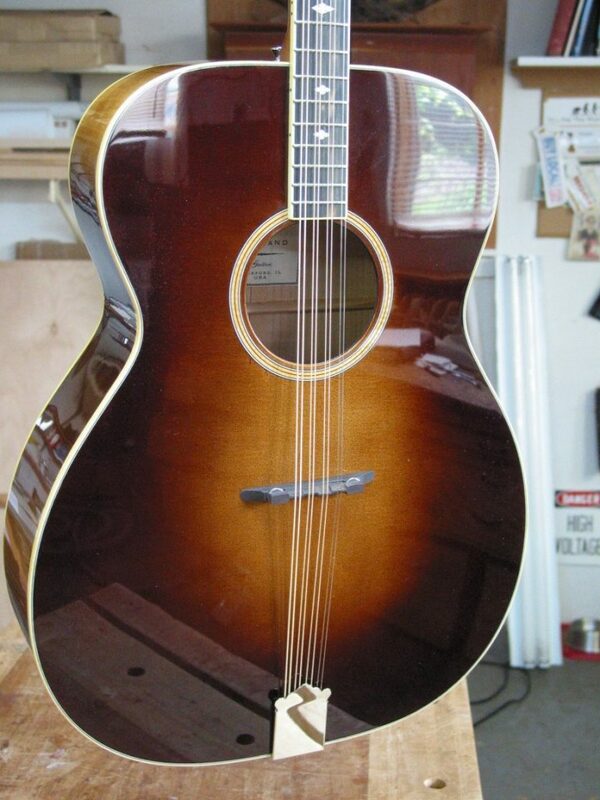 Thin body acoustic archtop. 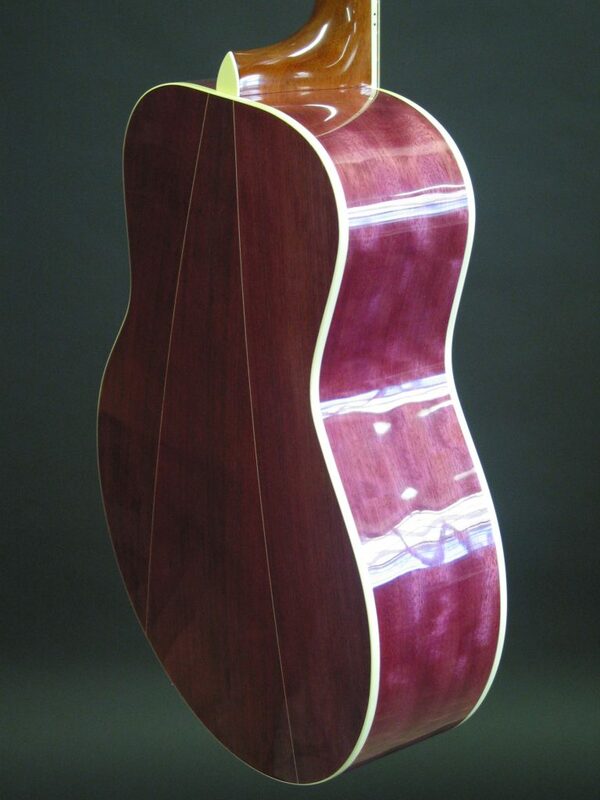 Rosewood back and sides with a cedar top and satin finish. Simple but elegant. 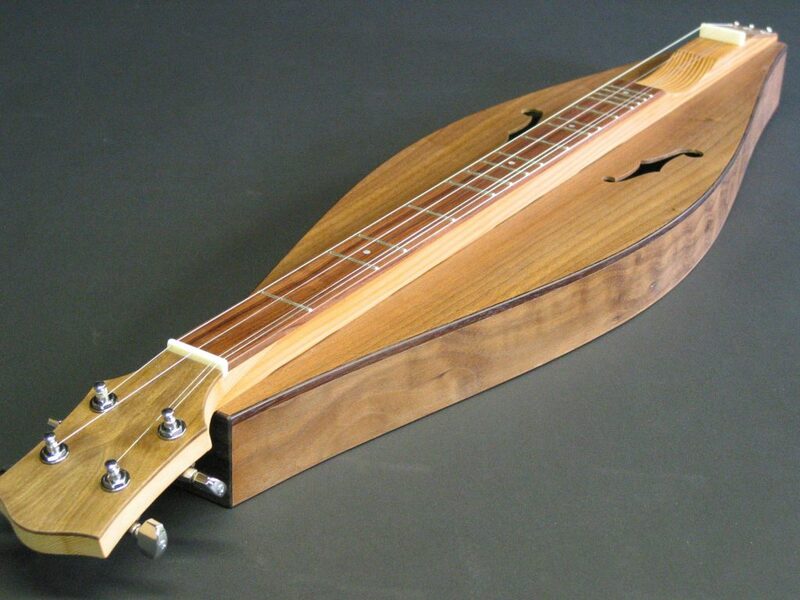 Lap dulcimer. Walnut. Simple. Fun! 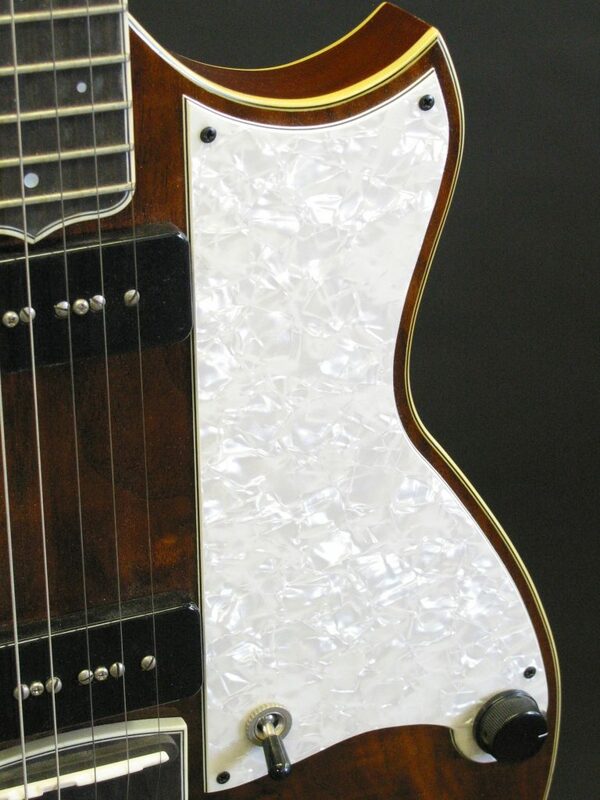 A hollow body electric with a baritone scale neck. 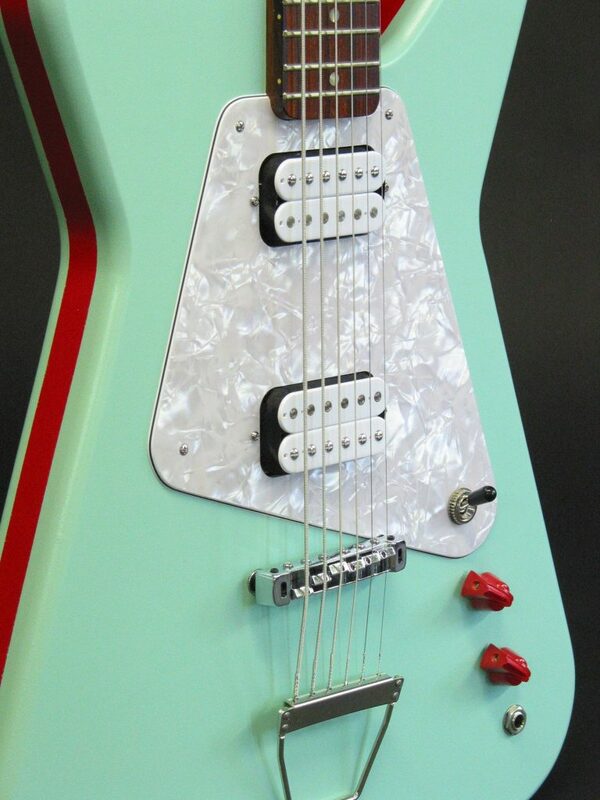 Surf green with pearloid humbuckers and pickguard. 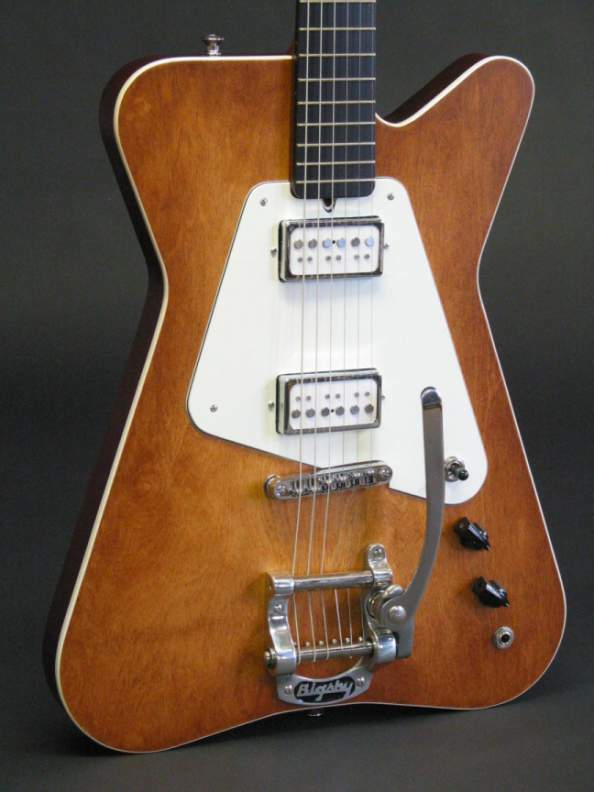 You can get more information about my SonoPhonic Guitars on my Worlatron page. 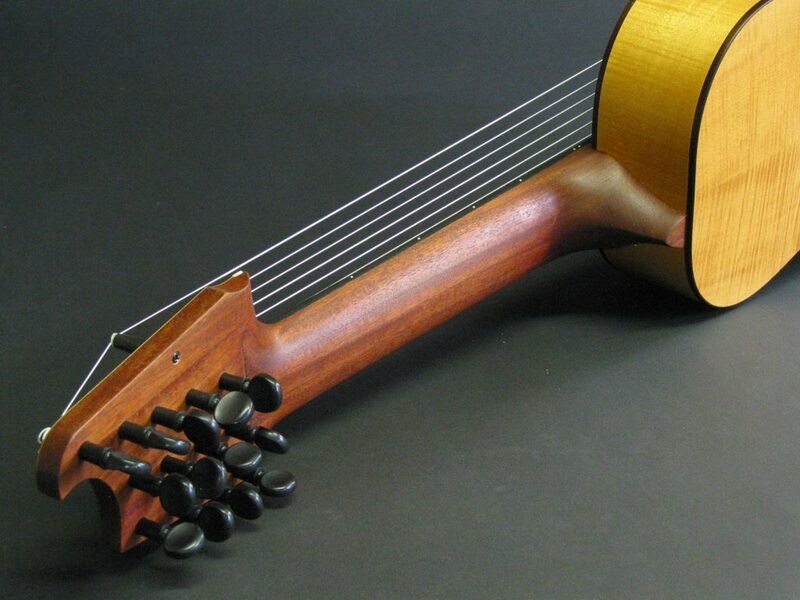 A 13 string guitar! 8 on the neck and 5 floating sub basses. 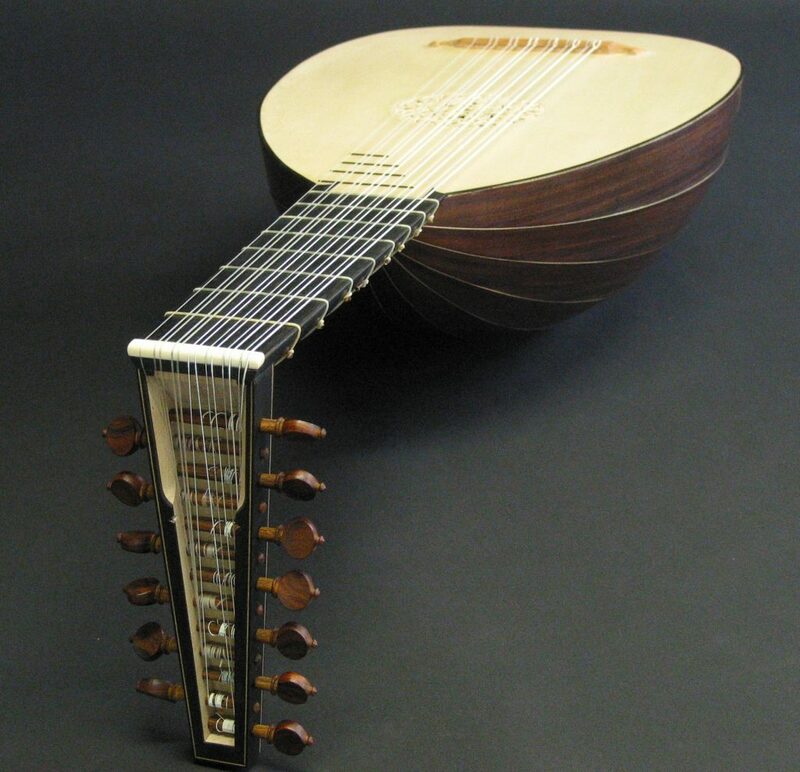 All nylon string which gives it a lute-like tone. Curly maple and spruce with a mahogany neck. 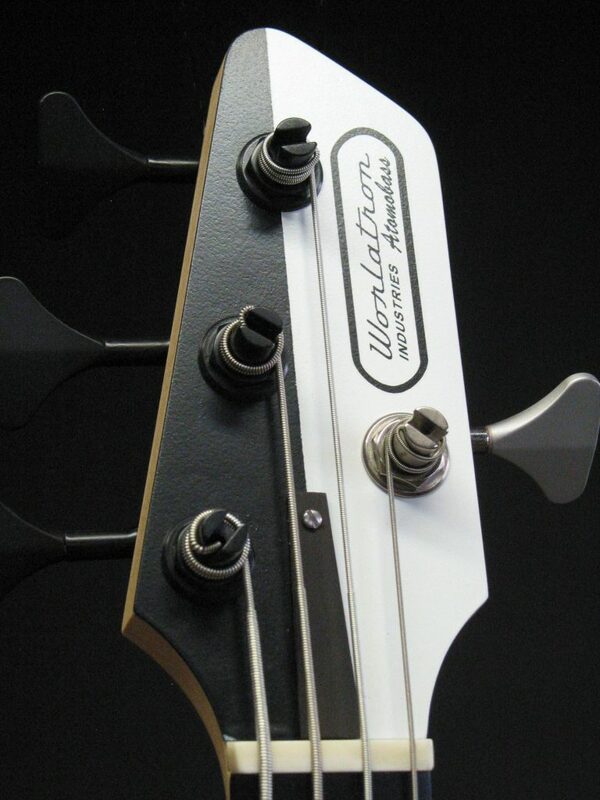 Atomobass! 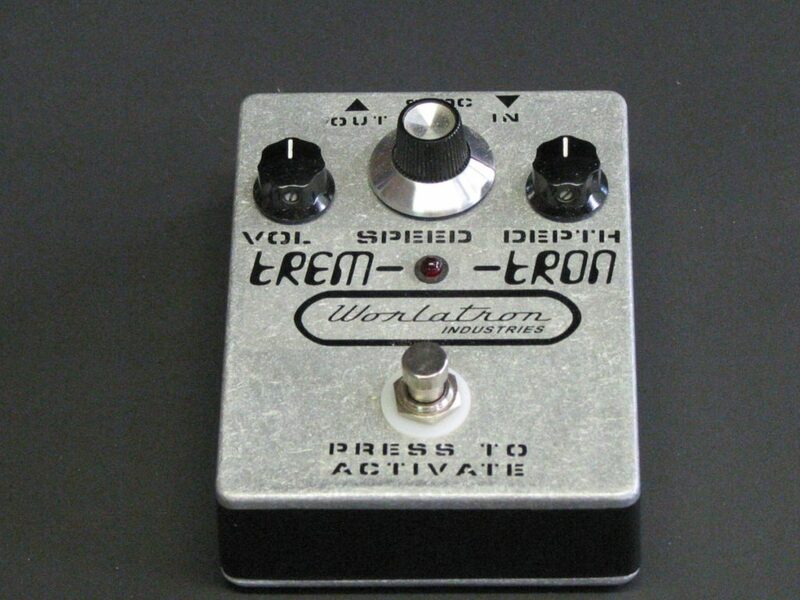 Built under my Worlatron electric brand. These are a couple of light weight basses with superhard phenolic fingerboards. One has a Thundertron pickup along with lipstick pickups. Fun and cool and sound great! 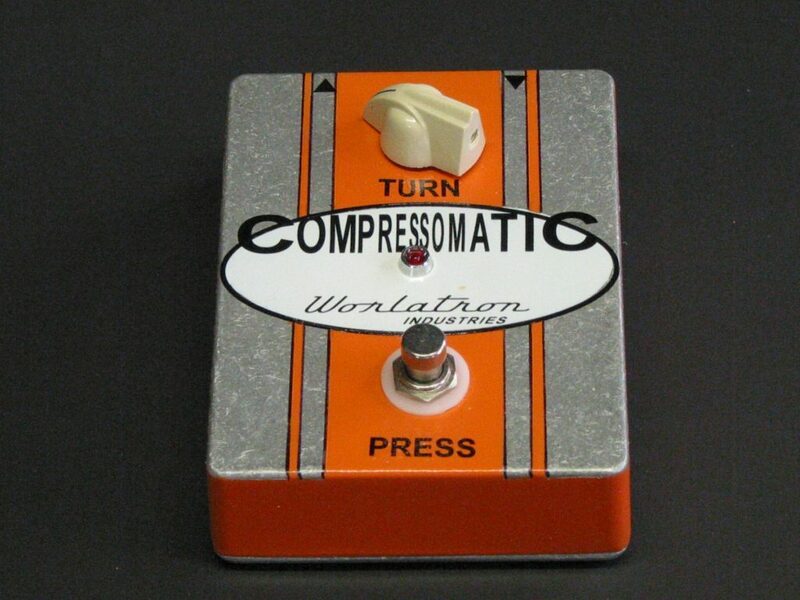 You can get more information about my SonoPhonic Guitars on my Worlatron page. 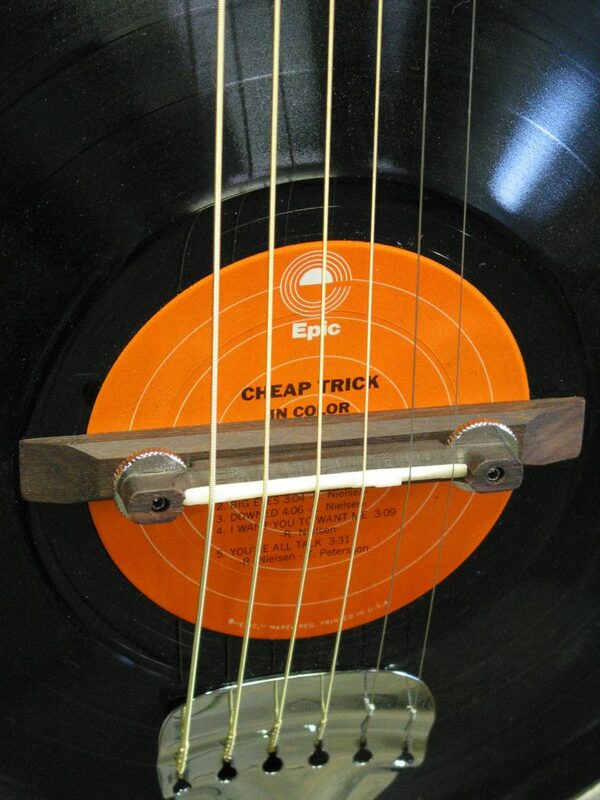 Cheap Trick. In Color and In Black and White. 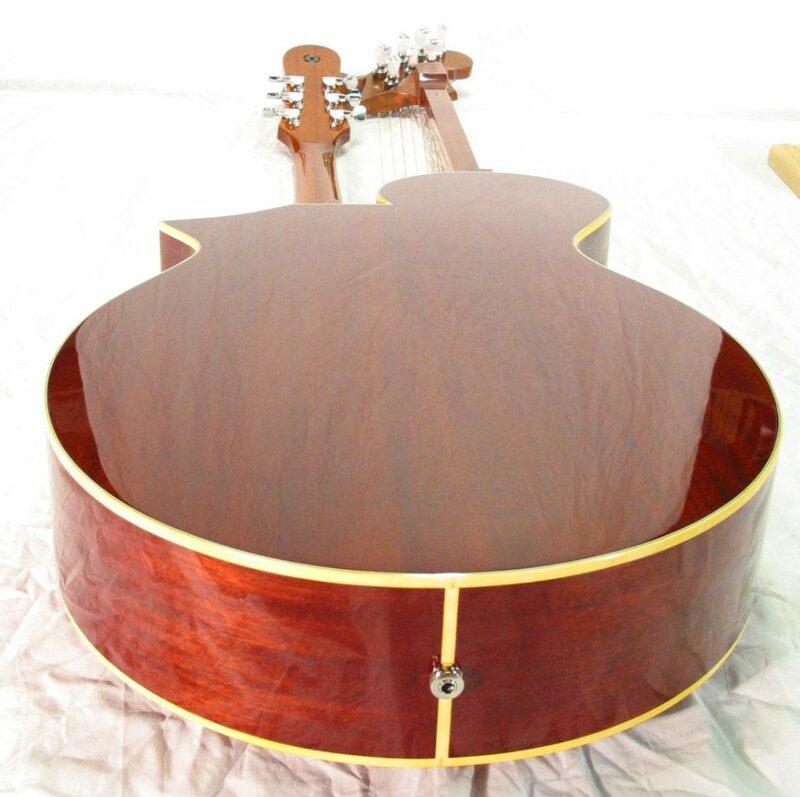 A real resonator guitar made from LP’s. The front LP is pressed into a cone shape and functions as a resonator cone so it’s still making music! Even the peg head is a Cheap Trick album. Built for a huge Trick fan. 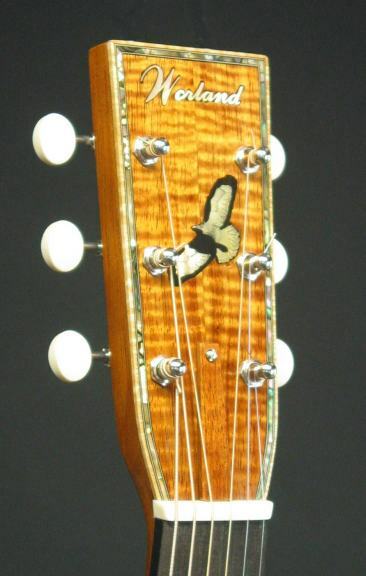 Built for a customer who’s wife commissioned it, it features some custom Prairie Style Frank Lloyd Wright inlay and a gorgeous sunburst finish. I found a cool looking slab of cherry and decided to make a lap steel from it. 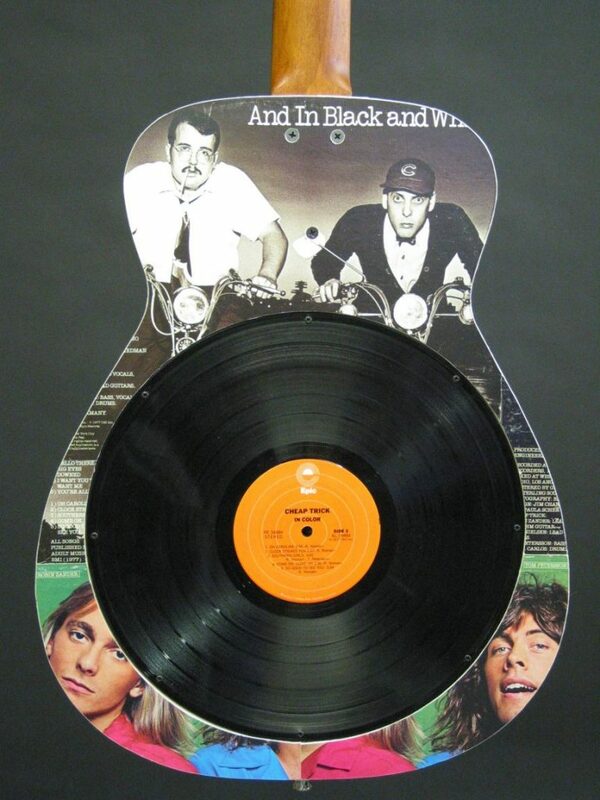 Looks great hanging on a wall as a piece of art but also sounds really good. 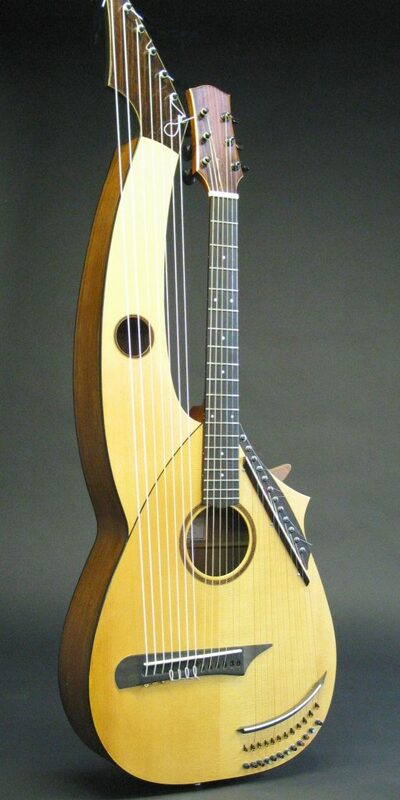 Custom harp guitar with a whole bunch of strings. 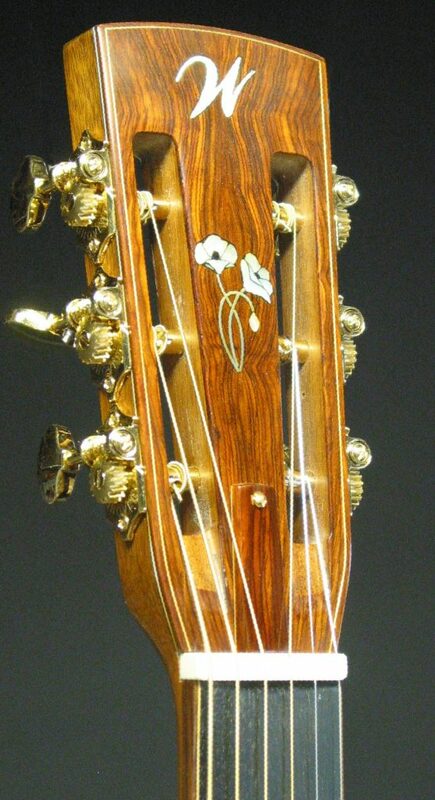 Another custom harp guitar with a lot of fancy inlay. 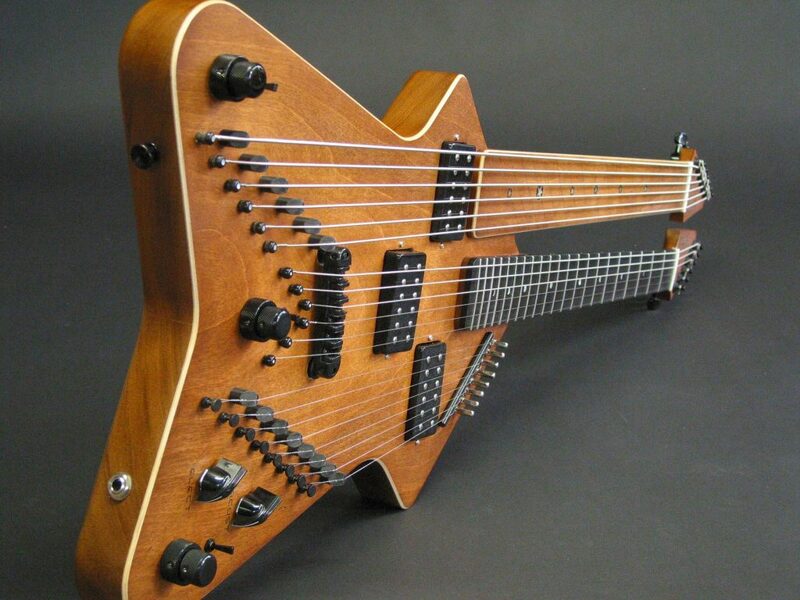 6 sub basses, 8 super trebles, 6 main strings, plus 12 sympathetic strings that run through the neck. 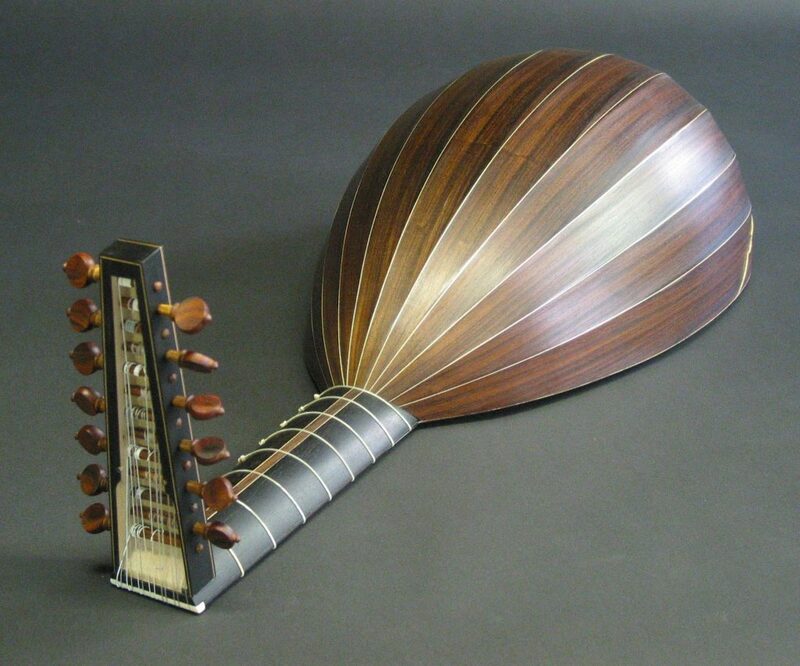 A sitar harp guitar with a very unusual tone. It has since been retrofitted with MIDI outputs. Lap steel made from walnut. 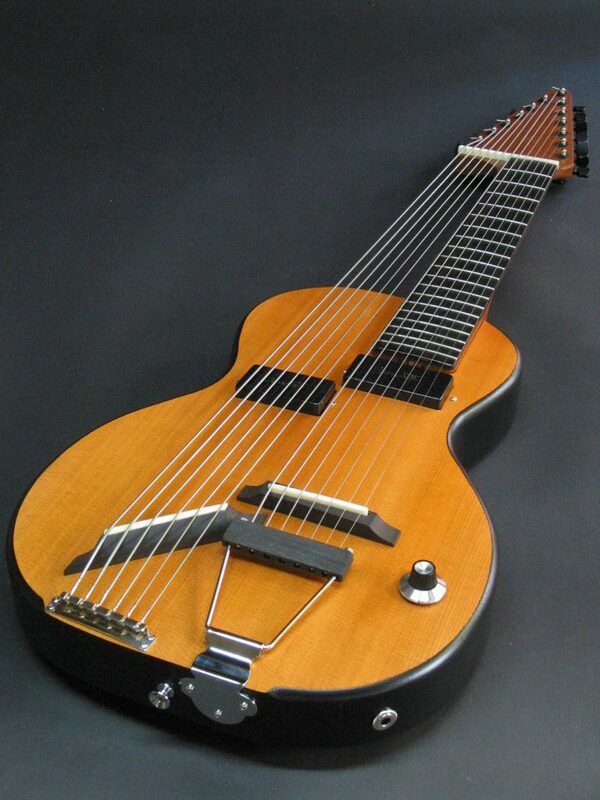 A solid body electric 20 string harp guitar. 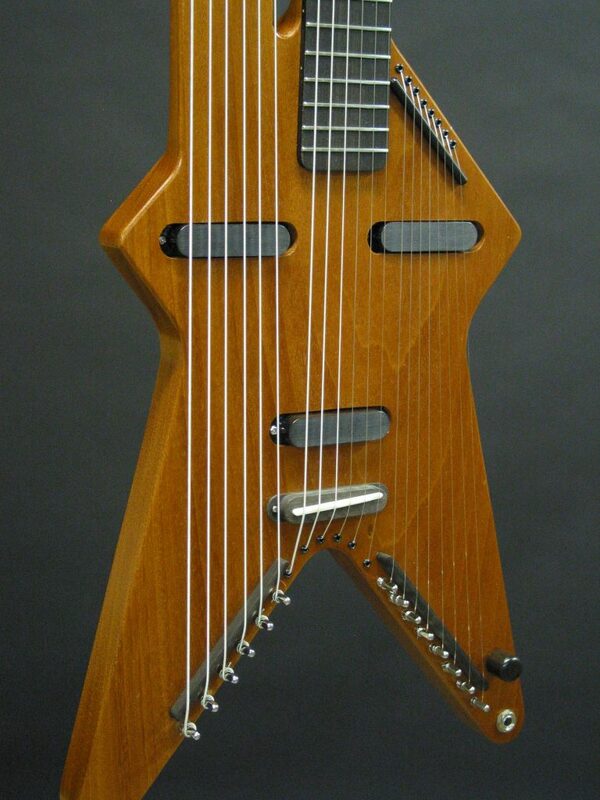 I call it the Electro Harp-A-Star. 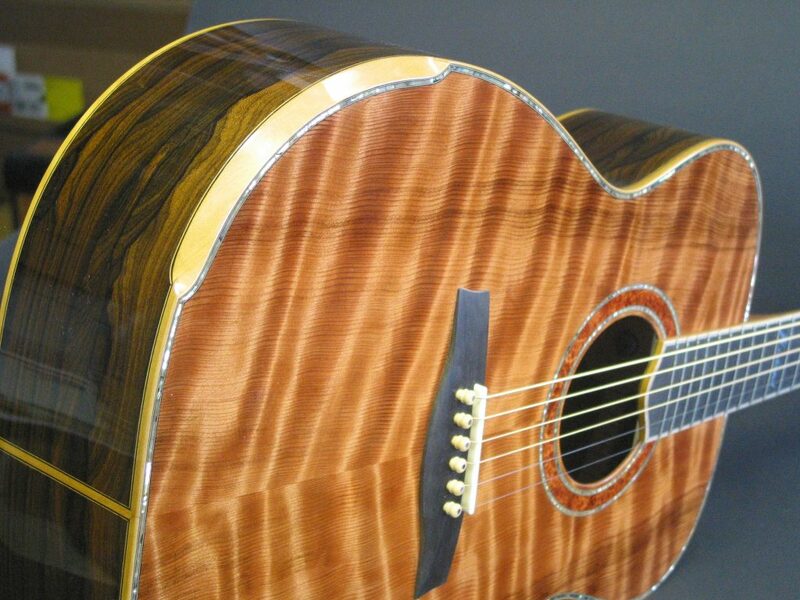 Custom acoustic for the owner of a guitar store. 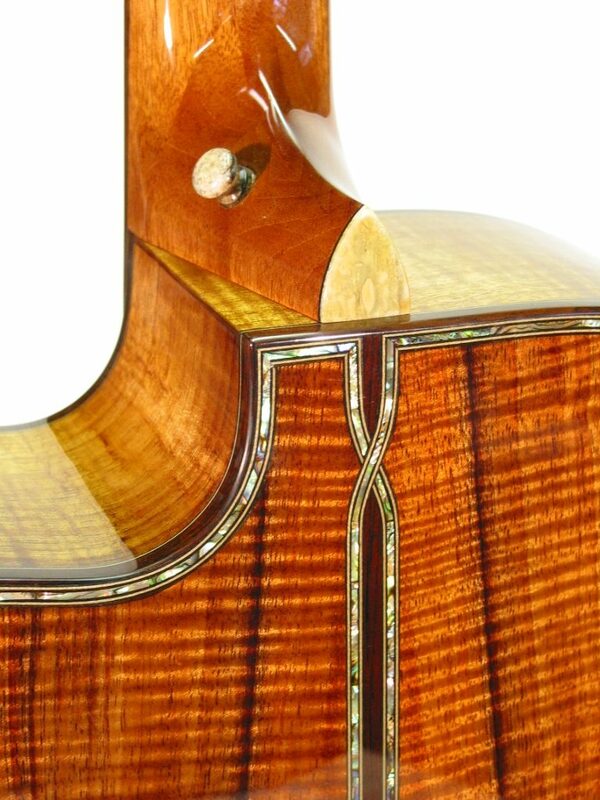 Curly redwood top, ziricote back and sides. Ambonya burl rosette and peg head. 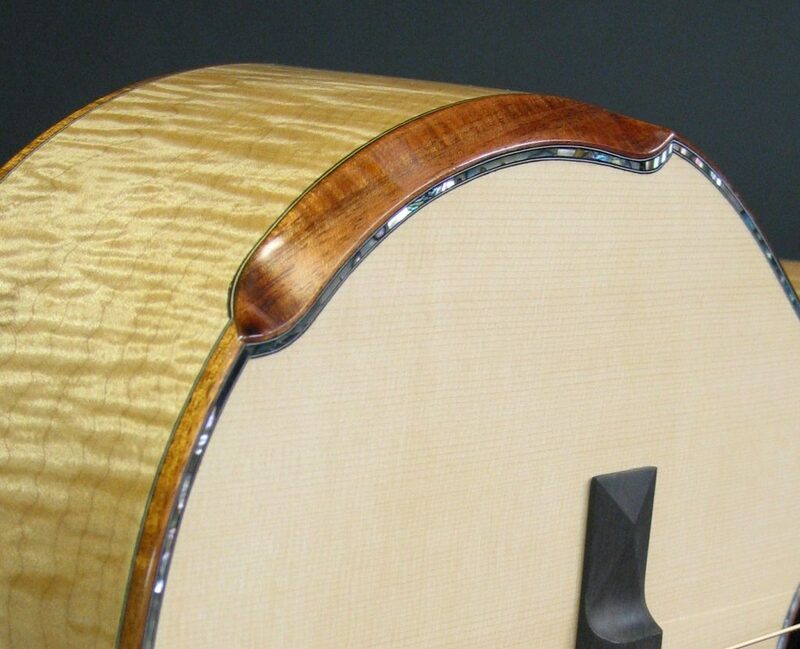 Boxwood binding and beveled Laskin armrest. 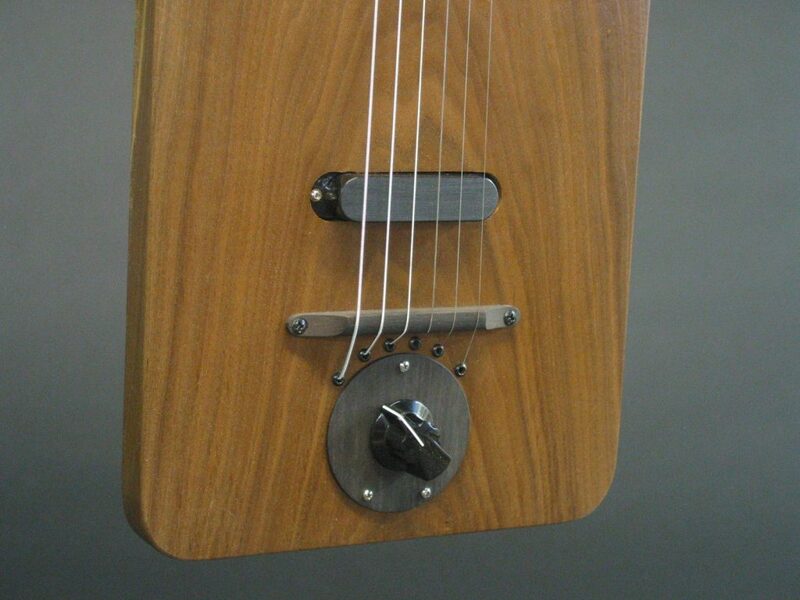 A lap steel guitar made from a wild slab of walnut. 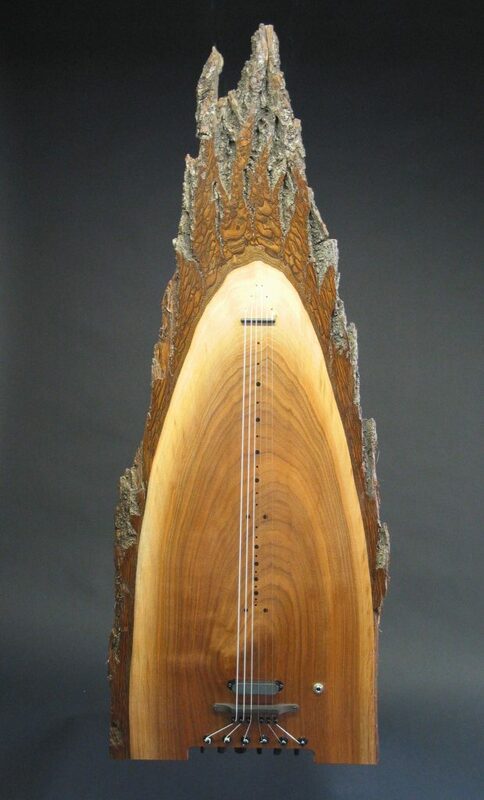 What more noble use for a tree than a musical piece of art? 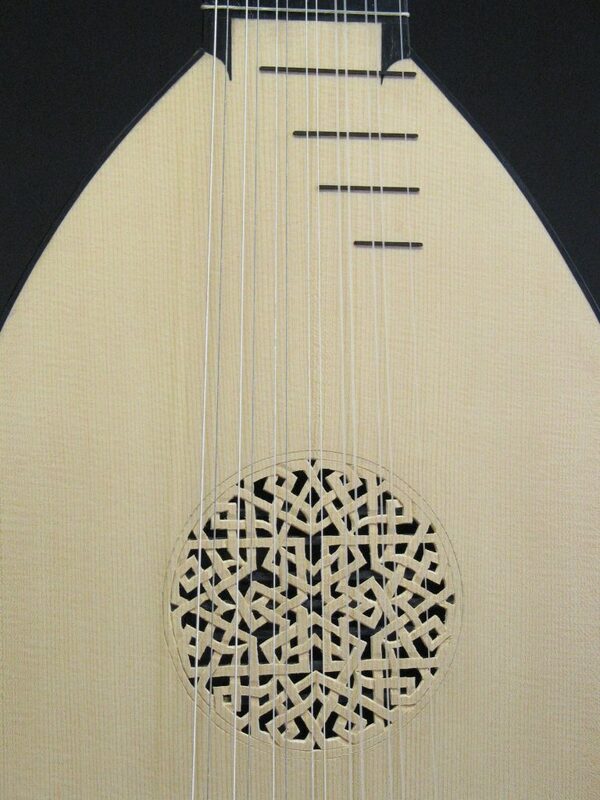 This a a Renaissance lute after Gerle ca. 1514. Rosewood bowl, carved rose, pearwood bridge. A very authentic reproduction. 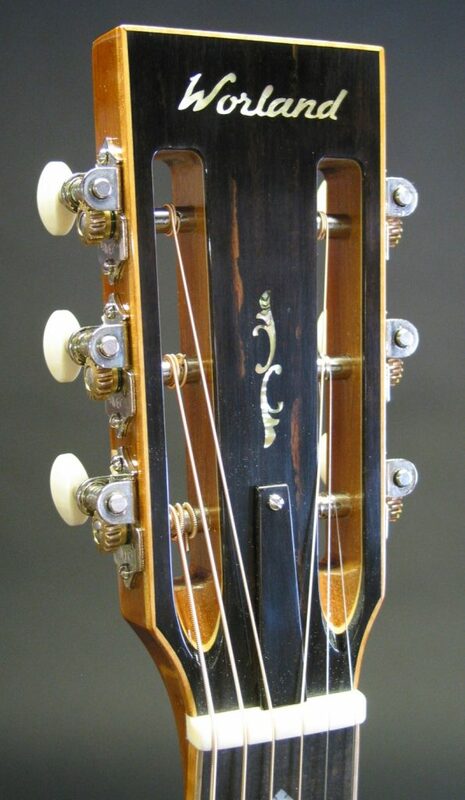 Like vintage guitars? This is from the 1500’s! 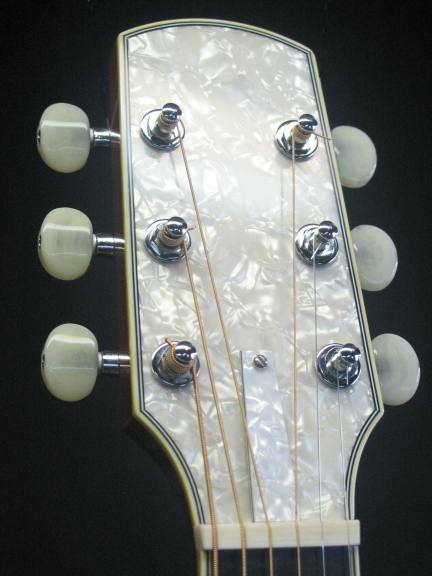 The customer spec’ed out everything on this guitar from the shape, similar to a Gibson L-00, to the inlay which was inspired by an old Silvertone. Yahoo! 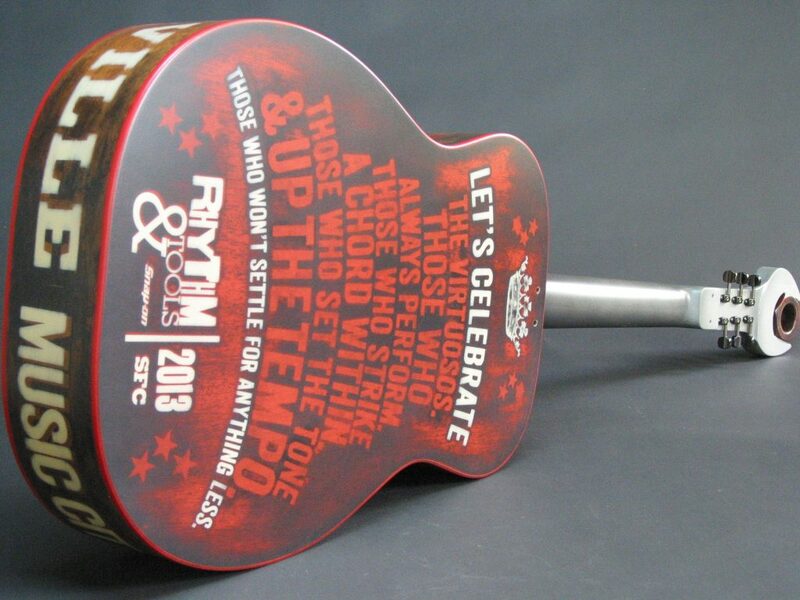 commissioned a guitar as a giveaway at the Austin SXSW festival. Of course it had to be purple so I used some purpleheart wood for the back and sides. This is one of the loudest acoustics I’ve ever built. 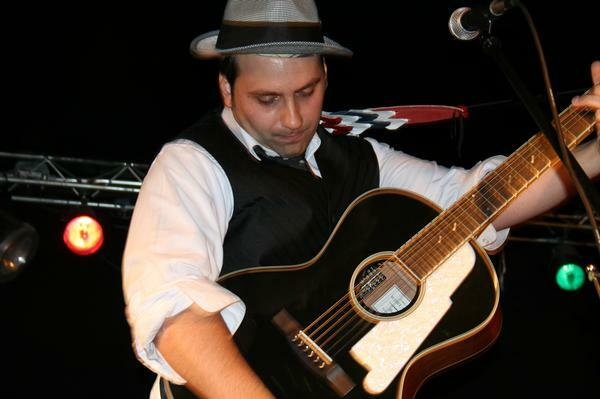 A cool black top acoustic with an old time feel. Sort of an art deco vibe. Looks good on the player! 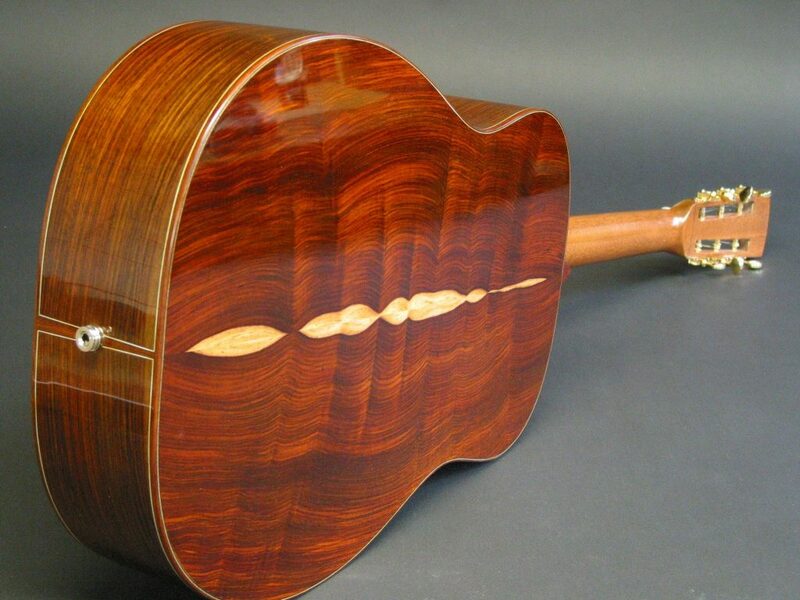 A parlour guitar with curly maple and koa trim. A RedTail hawk was requested on the peg head. 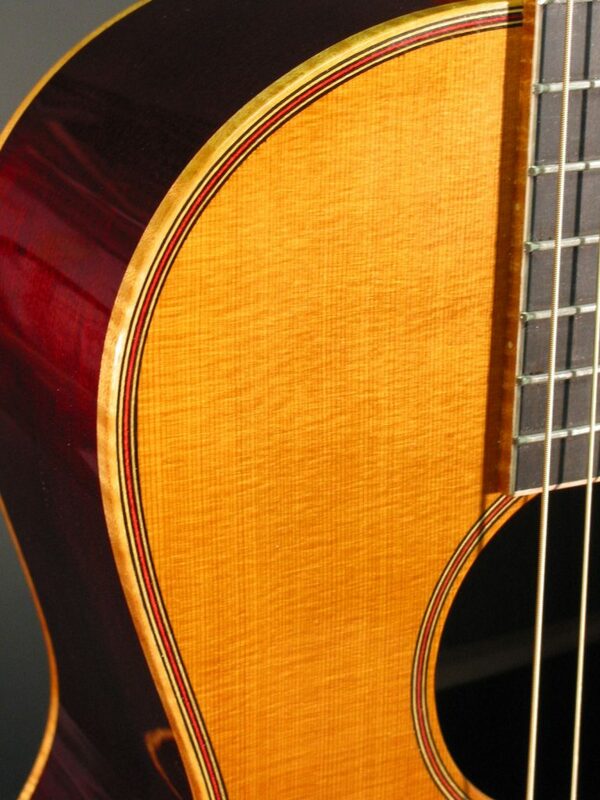 Another parlour guitar with a red “piano” finish. 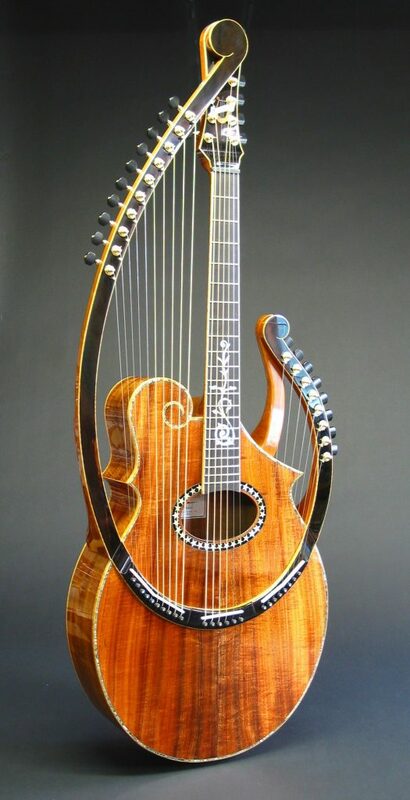 All Koa Lyra Harp guitar. Wicked! 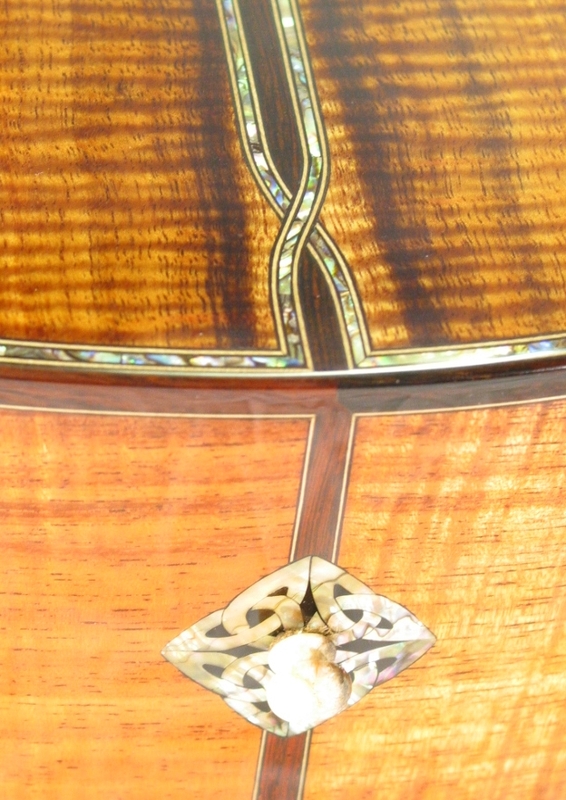 An all koa acoustic with a bit of abalone inlay. 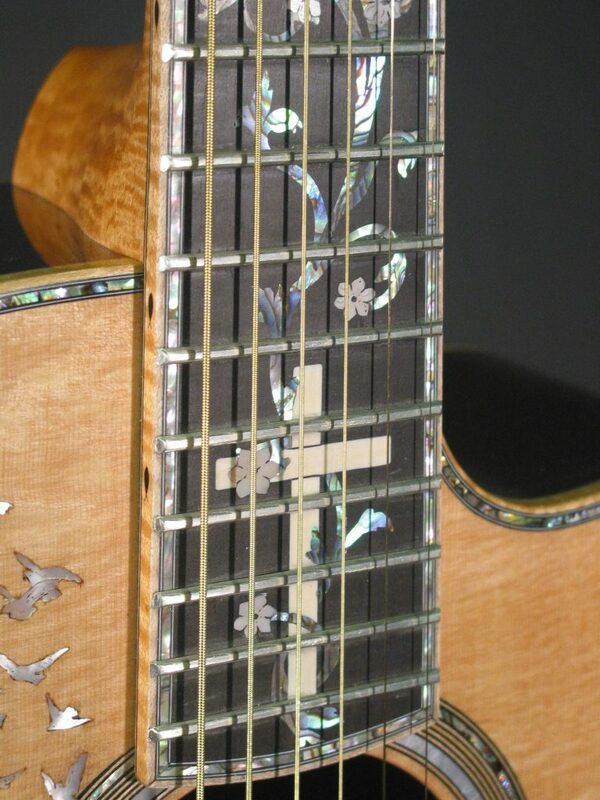 The customer want the loudest and flashiest guitar in his church! Amen to that. 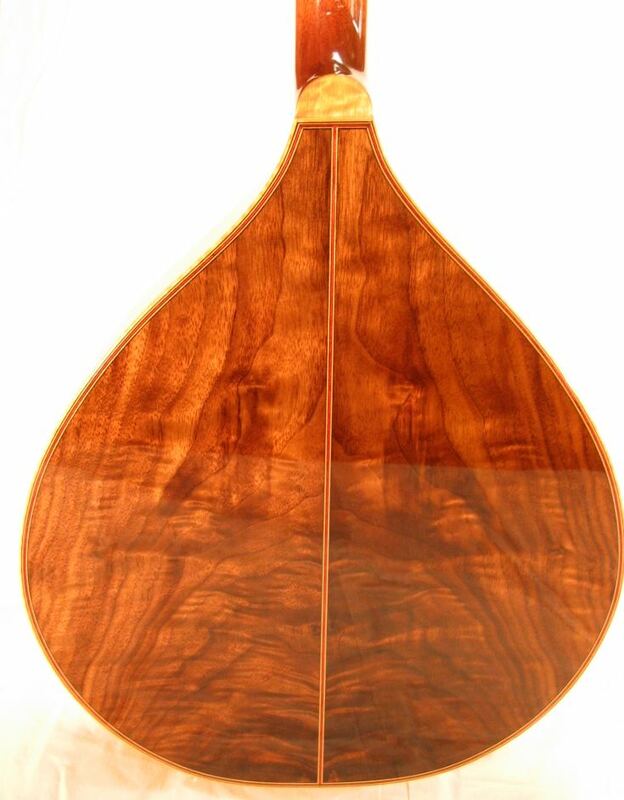 Irish bouzouki with a cedar top and curly walnut back. 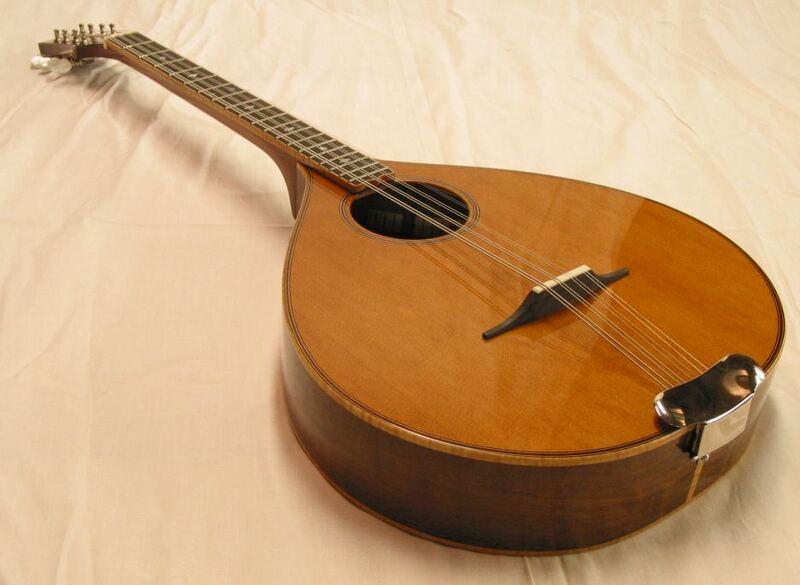 If you’ve ever played an old Gibson harp guitar you know they a big, heavy and rarely sound very good. 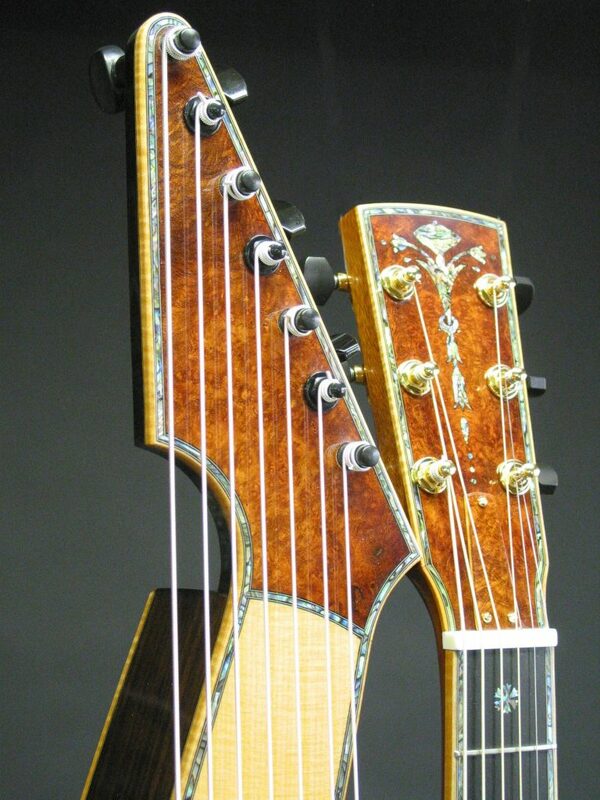 These are a light weight responsive version of the Gibson style U harp guitar. A good friend of mine wanted a custom baritone hollowbody with a special green colored top. The fingerboard dots are shaped like the phases of the moon. 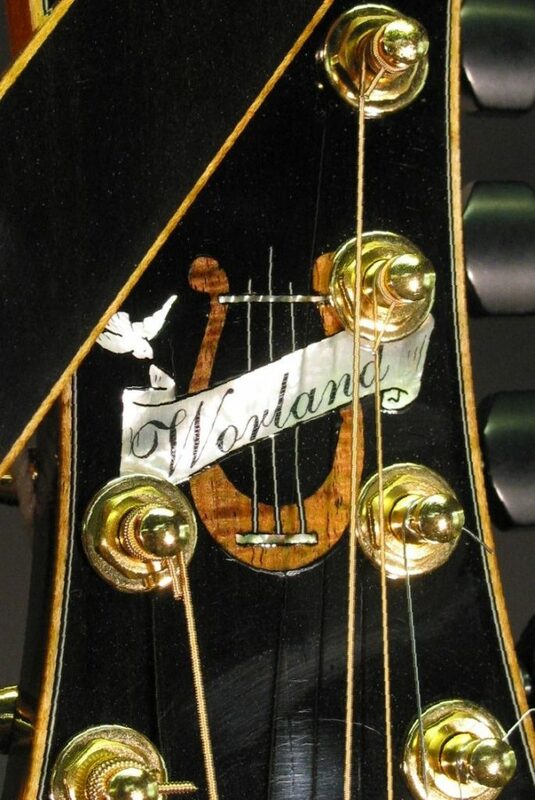 You can get more information about my SonoPhonic Guitars on my Worlatron page. 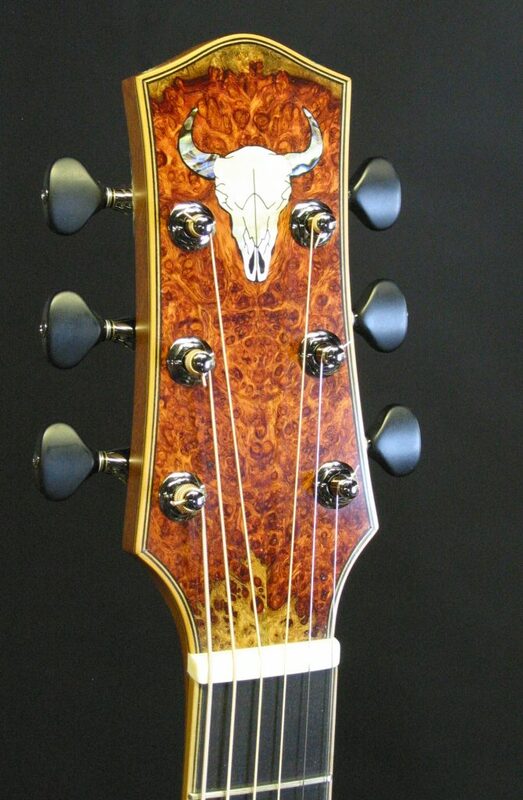 A custom solid body, mahogany with a curly walnut top and P90 pickups. Yes I make custom guitar pedals too. If you see anything you like or if you have some ideas of your own, let’s talk about it. You can email me here.